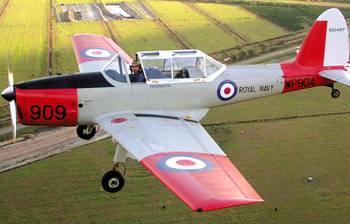 The de Havilland Chipmunk was originally designed as a post World War II primary trainer, a replacement for the venerable de Havilland Tiger Moth training biplane used by the air forces of the British Commonwealth throughout World War II. Among the tens of thousands of pilots who trained in or flew the Chipmunk for pleasure was veteran aerobatic and movie pilot Art Scholl. 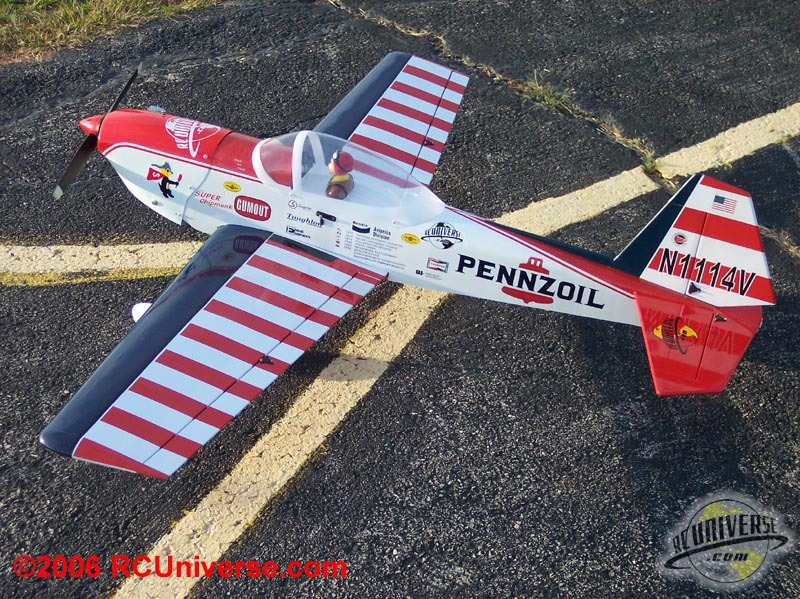 He flew his Pennzoil Special at airshows around the country throughout the 1970s and early 1980s, thrilling audiences with skill and showmanship, and proving that the design itself was a top-notch aerobatic aircraft. The Chipmunk was an all-metal, low wing, tandem two-place, single engine airplane with a conventional tail wheel landing gear. It had fabric-covered control surfaces and a clear plastic canopy covering the pilot and passenger/student positions. The production versions of the airplane were powered by a 145 hp in-line de Havilland Gipsy Major “8” engine. Art Scholl purchased two Canadian-built Chipmunks from the surplus market after they became available in the late 1950s and early 1960s. 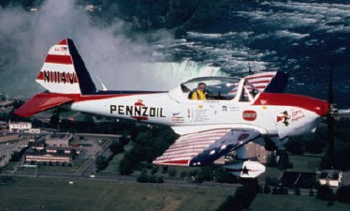 Using his skill as a licensed aircraft mechanic he modified the plane extensively, creating the Super Chipmunk by removing 20 inches from each wingtip and changed the airfoil section of the tip area, retracting the gear, converting it to a single-seater, adding an autopilot and a 260 hp Lycoming GO-435 flat-opposed 6-cylinder engine. When his popularity as a performer reached gigantic proportions in the 1970s he kept two Super Chipmunks busy on the airshow circuit, basing one on the East Coast and one on the West Coast. The Super Chipmunk is one of those planes that has been on my “I’ll get one when I get around to it” list for quite a few years. 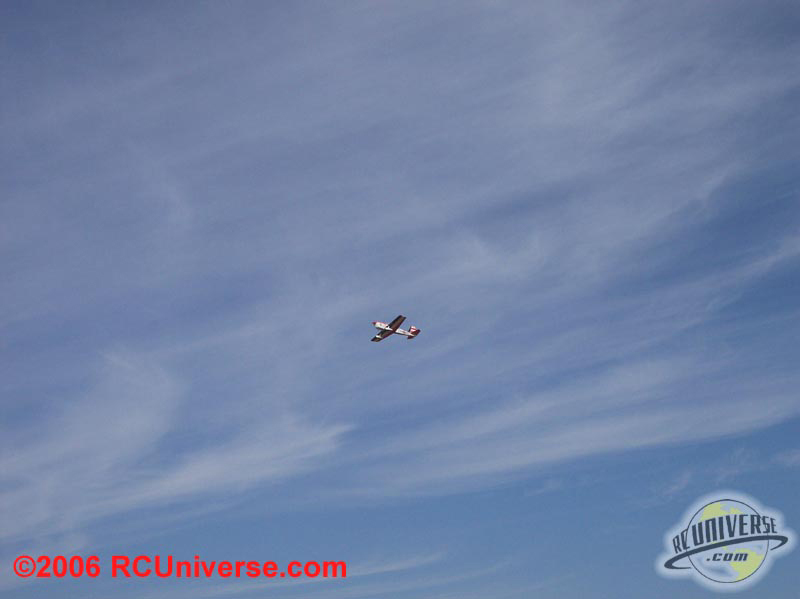 So when I had the chance to review World Models’ Super Chipmunk RF I didn’t have to be asked twice. 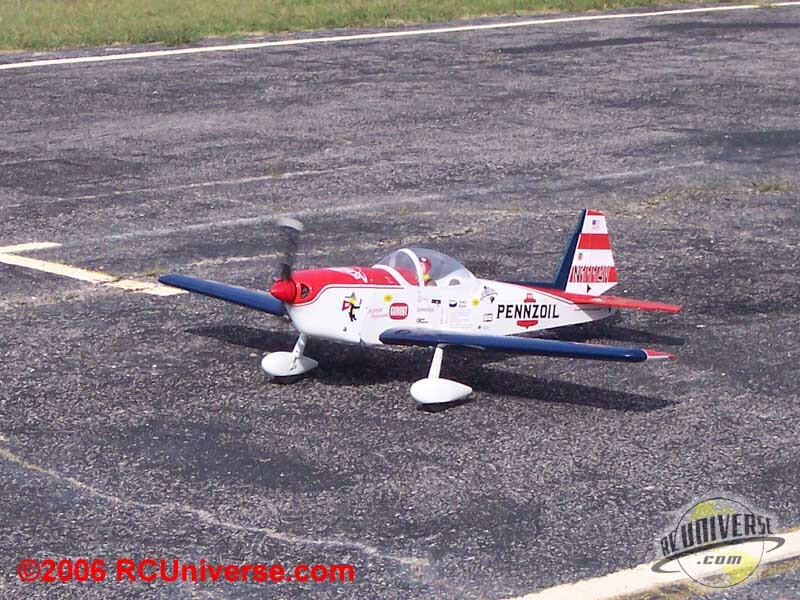 World Models has always had a great reputation of producing quality ARF aircraft so I was pretty sure I couldn’t go wrong. I definitely wasn’t disappointed with this airplane. 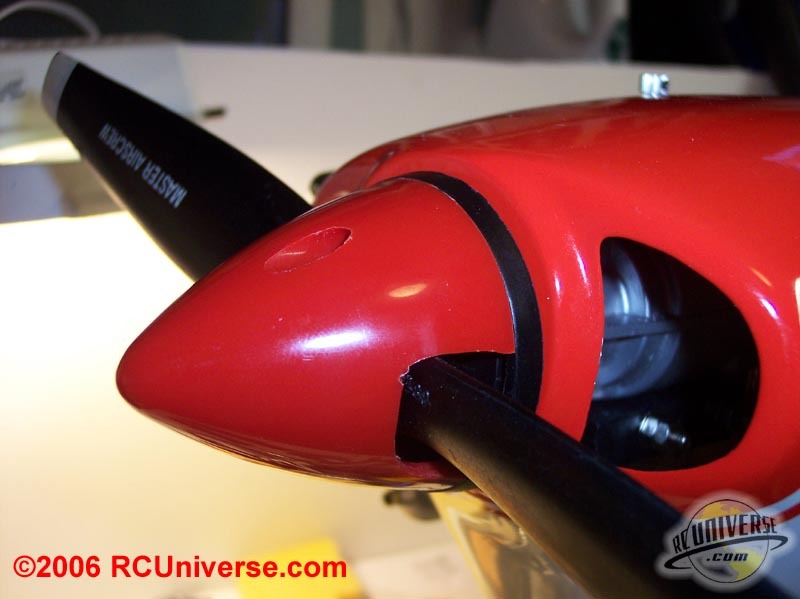 So let’s get started and take a look at World Models’ Super Chipmunk RF…. Unpacking all of the assemblies I found a few things that were really nice to see. First off was the cowl. For anybody that has ever struggled in cutting openings in the cowl, there is an included cowl overlay to aide in getting these opening correct. 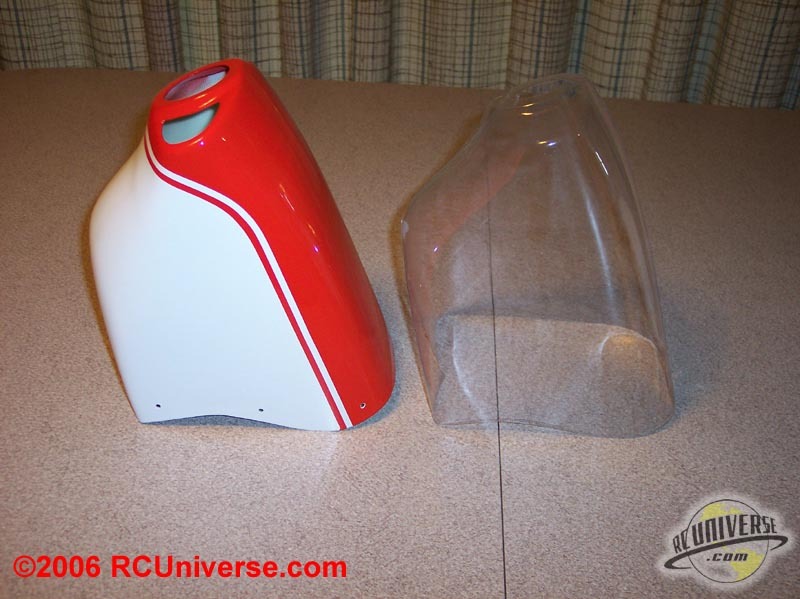 The overlay is made of clear plastic and is the same shape as the cowl. 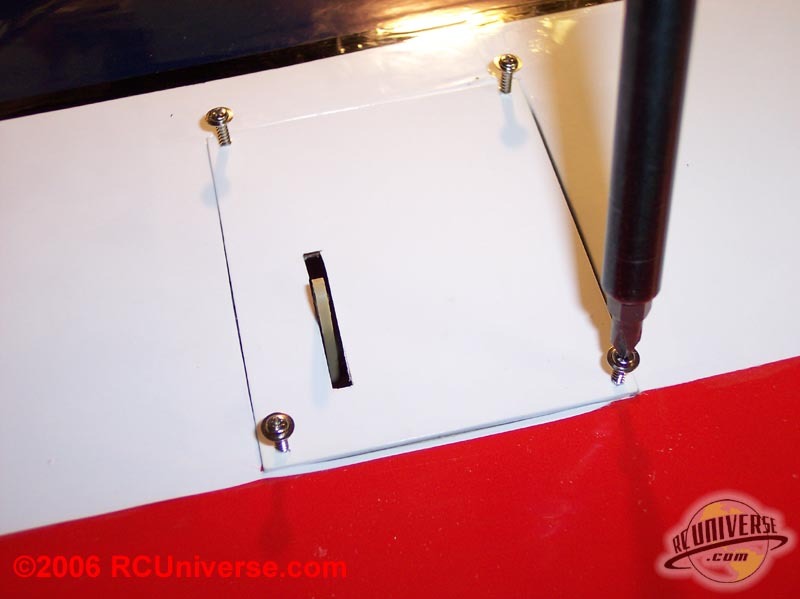 This let’s you make your cuts for the openings in the cowl before you ever start cutting on the cowl itself. The sub-assemblies such as the horizontal and vertical stabilizer come with the covering already removed in the areas where they will join the fuselage. 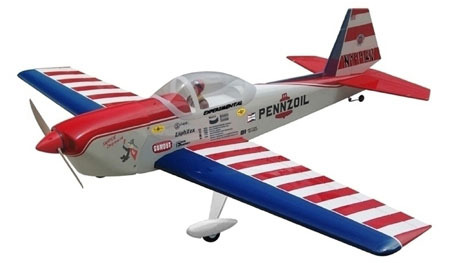 This makes it a lot easier for the modeler to successfully assemble the plane. A look inside the fuselage shows that it is well constructed and should have plenty of strength to stand up to the high stress acrobatics. I was especially pleased with the packaging of all the small hardware for this plane. 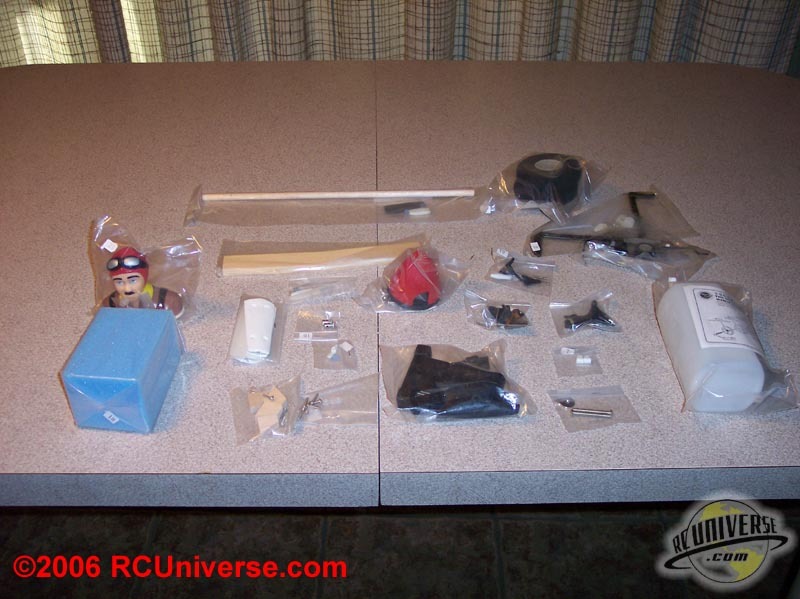 All of the parts are individually packaged in small plastic bags. Especially nice is the fact that all the bags are labeled to indicate the step in the instruction manual that they are installed on. Anybody that’s ever hunted through a bag of screws to find a specific one will appreciate this touch. As I unpacked and inspected all the parts for this plane I was struck with the thought of how complete the hardware package was. 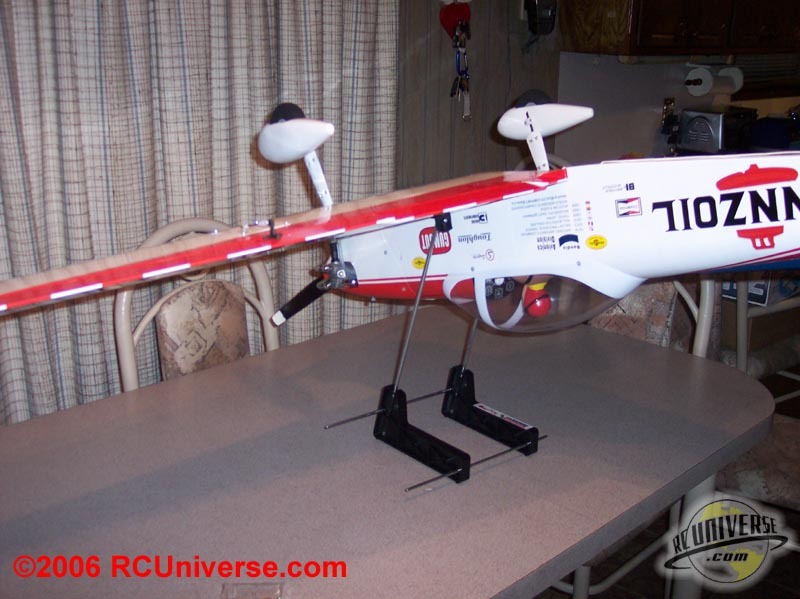 Some items that are normally left up to the user to provide in other ARF’s are included with this plane. These include the wheels, spinner, and fuel tank. 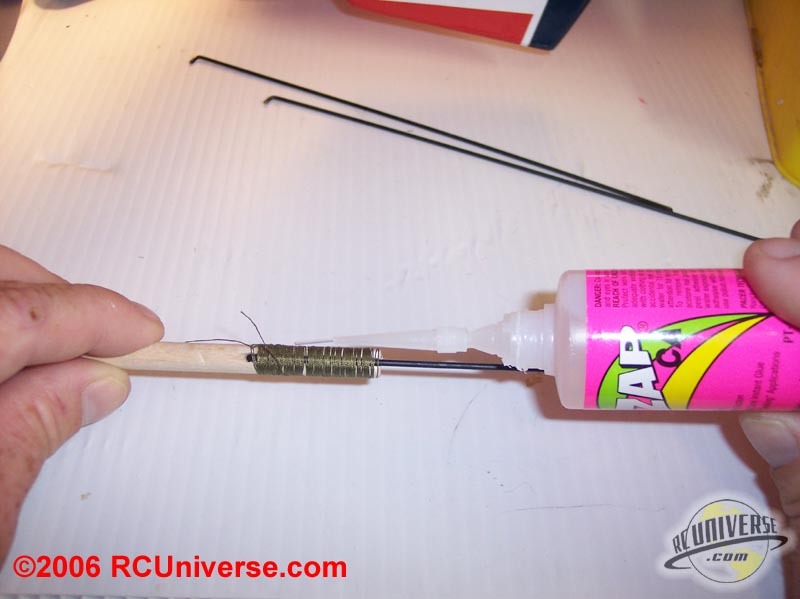 In fact, looking at the items needed to finish the plane shows that all you will need to supply is the fuel tubing. Very nice touch World Models!! 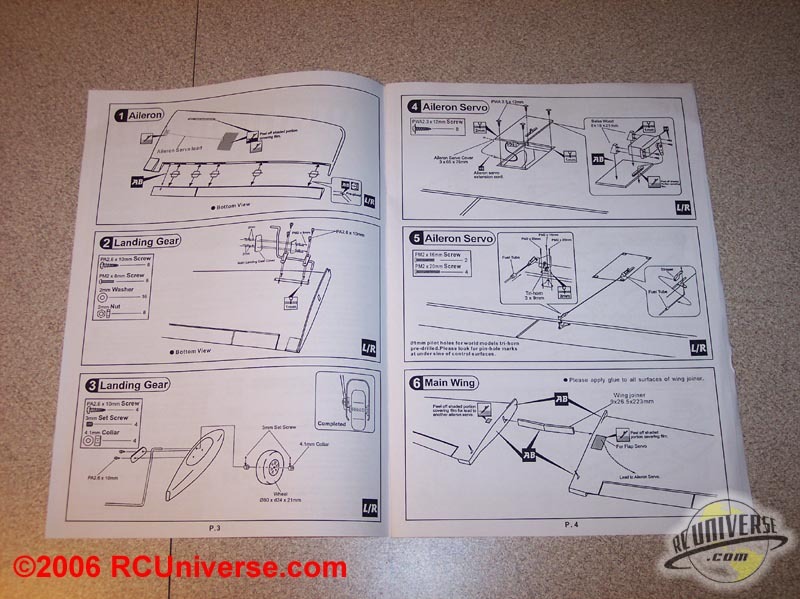 These days it has become more or less a standard for ARF’s to have the instructions in manuals that are in a picture format instead of written instructions. This lets the manufacturers overcome language barriers that can occur in translation of those instructions. 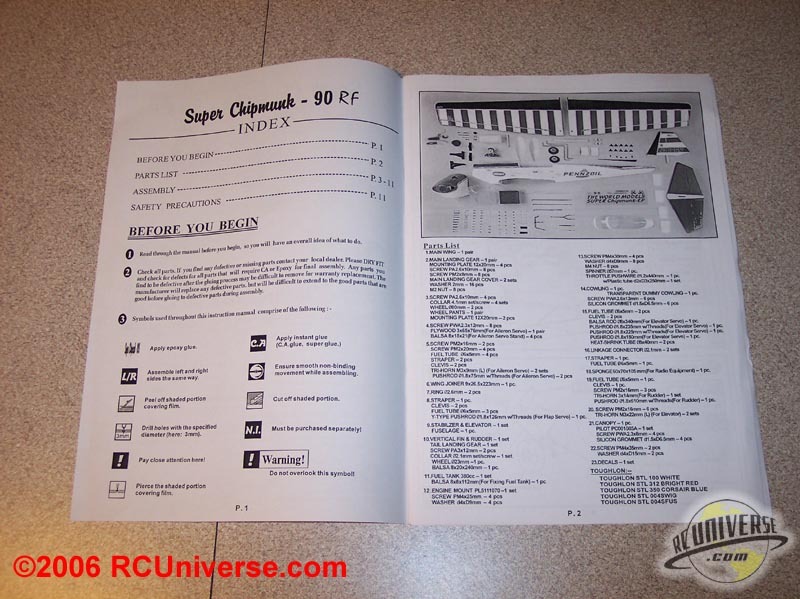 The instructions for the Super Chipmunk are this type of instruction booklet. While all the instructions are pictorial please don’t think that means they aren’t very helpful. The instructions are clear and helpful. 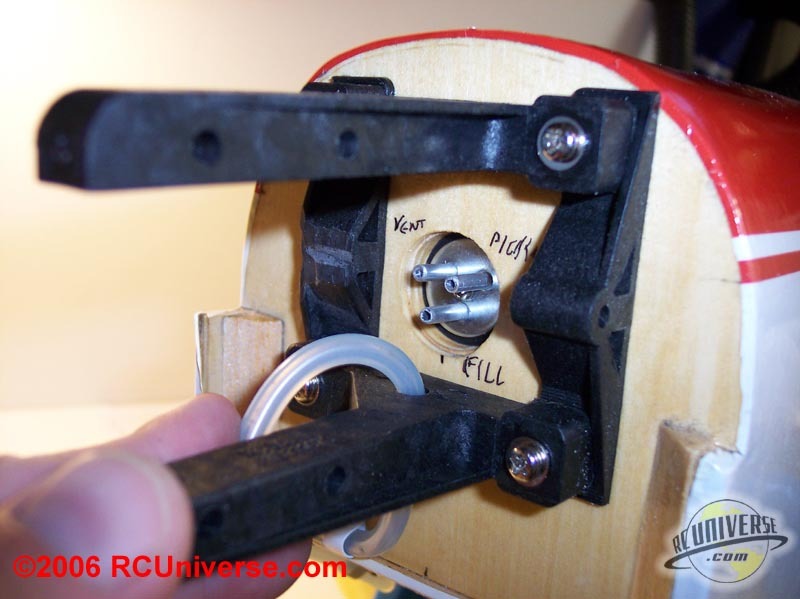 Each instruction also tells you what hardware will be needed for the given step. This in addition to the hardware bags being labeled with the step number makes it next to impossible to get the wrong hardware for each step. Most modelers should have no problems successfully assembling this plane using these instructions. Most of the ARF’s on the market today will come out of the box with wrinkles in the covering. While not an actual “step? in the instruction manual, I prefer to do this on any ARF that I have just to be sure. 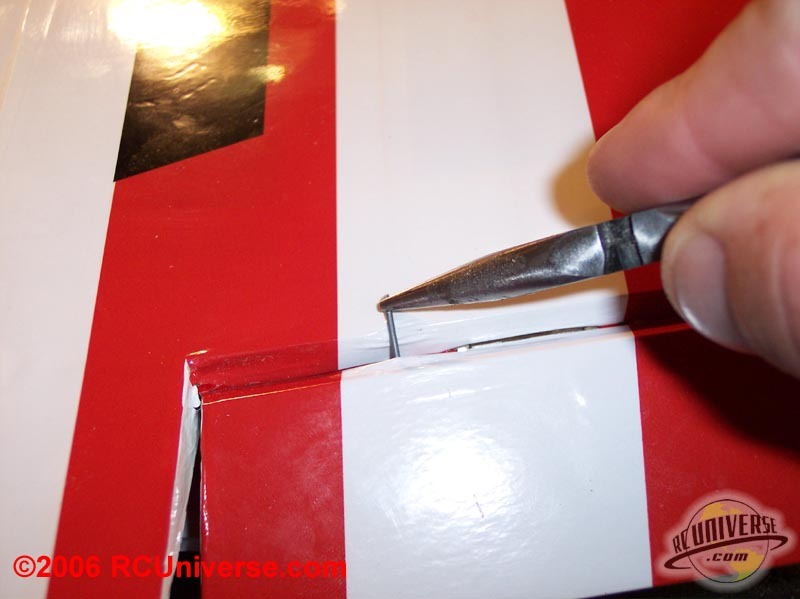 A good point to follow is to make sure that all the edges are sealed down tightly. The plane had a few wrinkles in the covering, but a heat gun and sealing iron made quick work of getting them out. Here was where I had a small problem with this plane. As I was using a heat gun to take out the wrinkles the covering pulled apart at the seams where two pieces of covering were joined. It took a bit of work to fix the problem after they pulled apart. So a word of warning is in order here, use a trim iron to go over all of the seams first before applying a heat gun to remove the wrinkles in the covering. 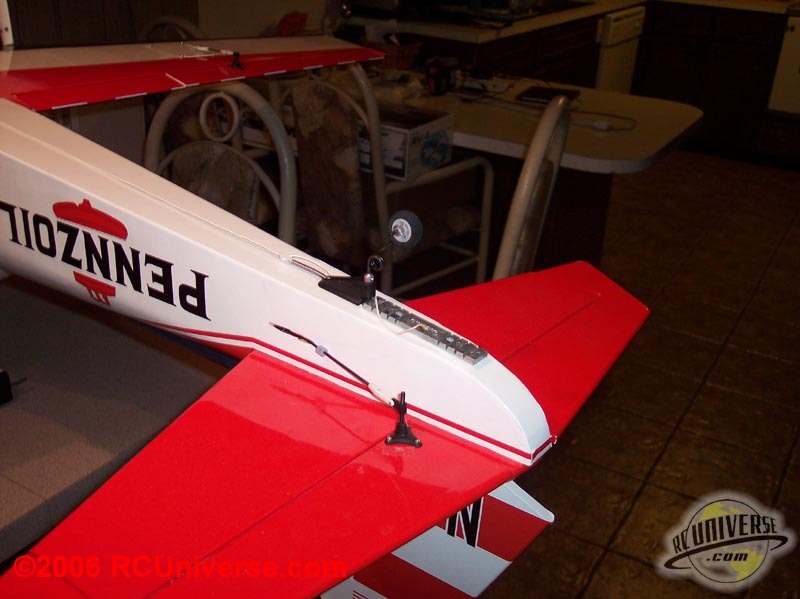 When it came time to install the control surfaces (i.e. 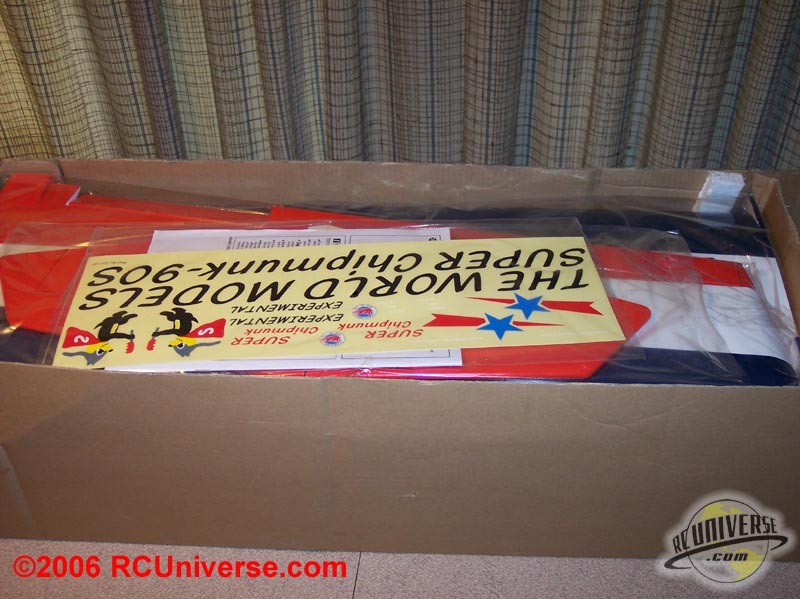 ailerons, elevator, rudder, and flaps) I had a very pleasant surprise. The control surfaces were pre-installed. Trust me when I say that I was just a bit more than skeptical on this. 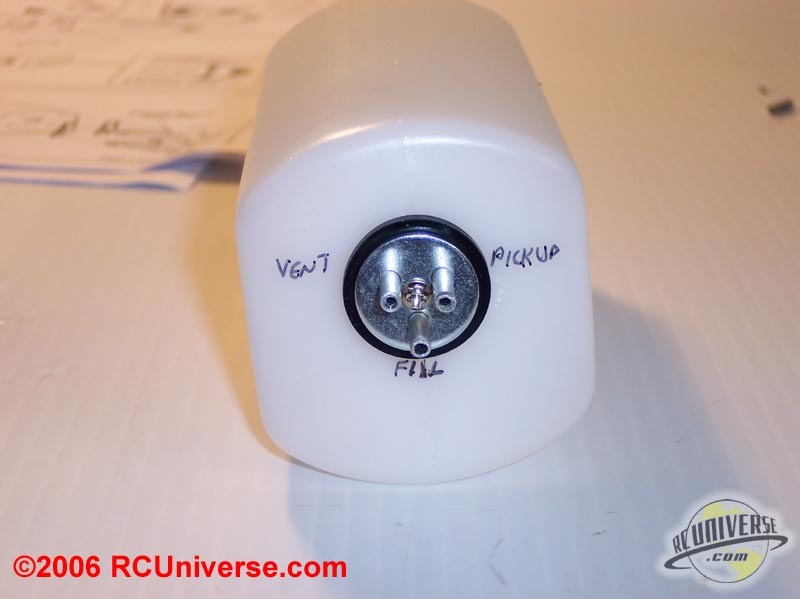 I’ve had plenty of ARF’s that came out of the box with the control surface “in place? but a little tug had them come off, and then needing proper installation. So with that in mind I “tugged? everything here to make sure that they were indeed installed and glued in place, and I even went back over it a second time and pulled even harder just to be sure!! But it is true; all of the control surfaces were already installed. And I must say that they did a great job installing them too, all of the gaps between the control surfaces were small or non-existent. This is some very good craftsmanship here. As I mentioned above in my “Misses? there was a small problem with the flaps on this plane. There was some play in the flaps: the torque rods mounting controlling the flaps were loose in the mounting holes inside of the flaps themselves. This gave me some concern because I was really worried this would cause flutter in flight. Normally this would be easy to fix, but because the control surfaces were pre-mounted in this plane my options for repair were a bit limited. I finally came up with a solution that took care of the problem. I was able to cut a small piece of music wire and push it down into the flap along side the torque rods. This took care of the problem and there was no movement in the flap after this was done. Make sure you double check your plane as you assemble to make sure this doesn’t happen to you. The wing on the Super Chipmunk is joined with a standard wood dihedral brace. 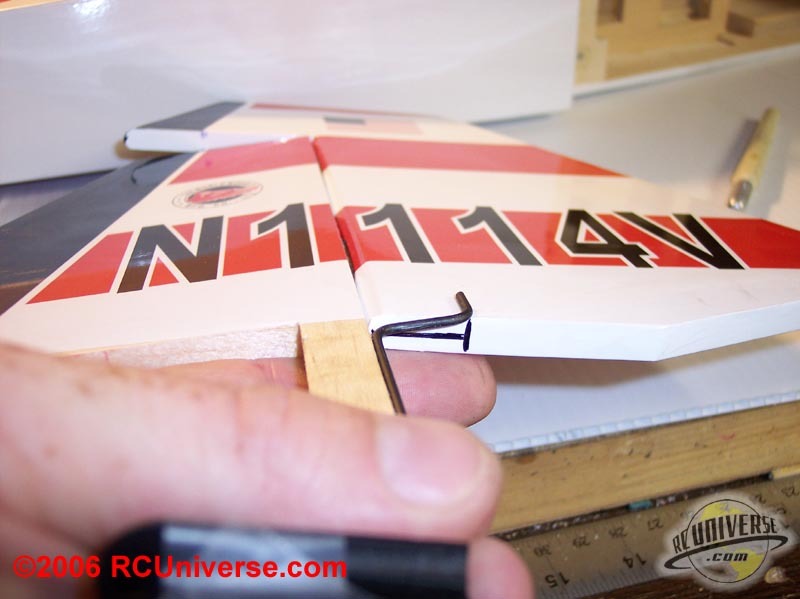 This makes attaching the wing halves a simple procedure. The covering for the wings is already removed in the area to be joined, leaving clean bare wood to apply epoxy to. I used 30 minute Z-Poxy to join the wing halves. 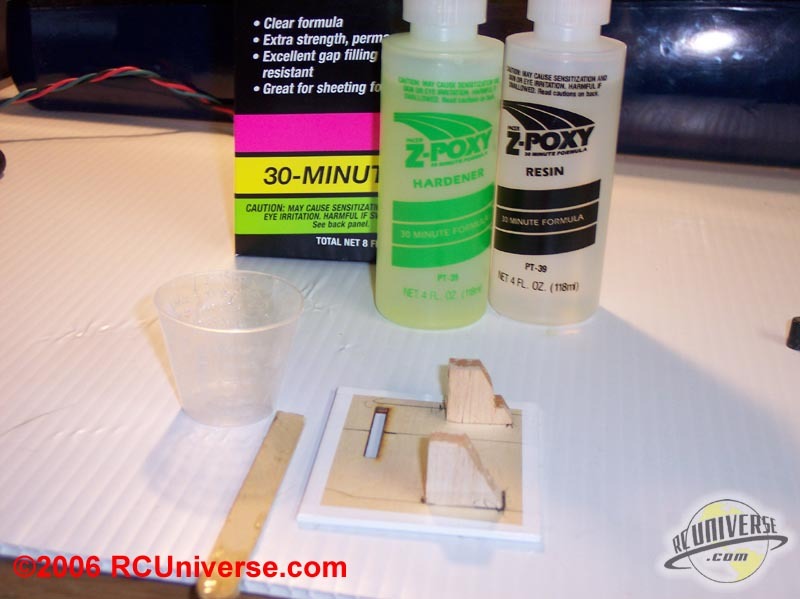 I prefer to use 30 minute epoxy for joining wing halves because it gives a much stronger joint than lower work time epoxy, plus it gives you more time to get the epoxy applied and the halves joined before the epoxy starts to set. 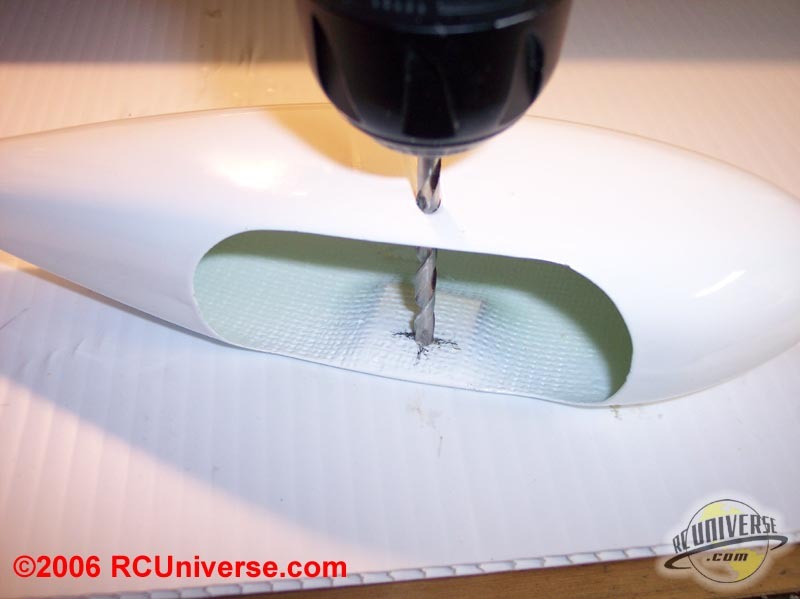 Apply the epoxy into the dihedral brace socket, to the dihedral brace, and the wing half surface itself. One thing that is difficult on some planes is holding together the wing halves while the epoxy sets. On the Super Chipmunk there are a couple of ready made clamping points. 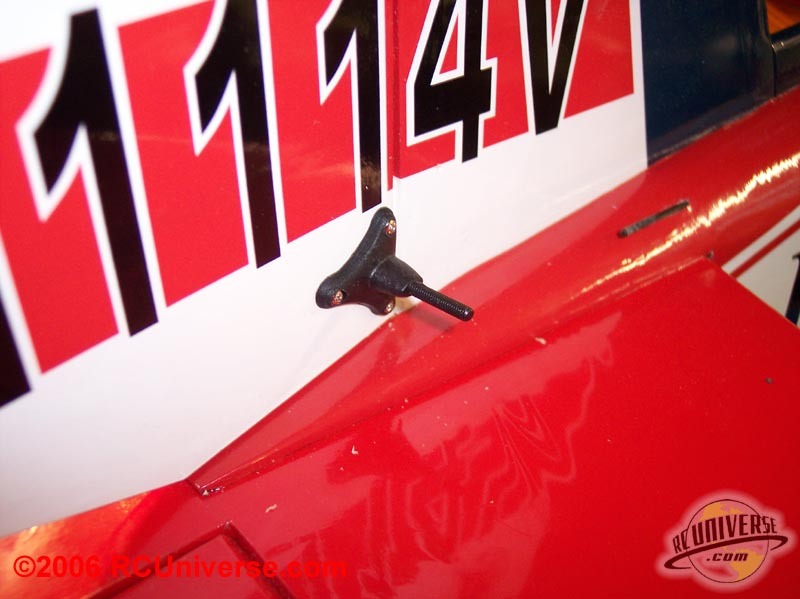 The front wing mount tab and the rear wing bolt plate make great points to clamp the wing halves together. 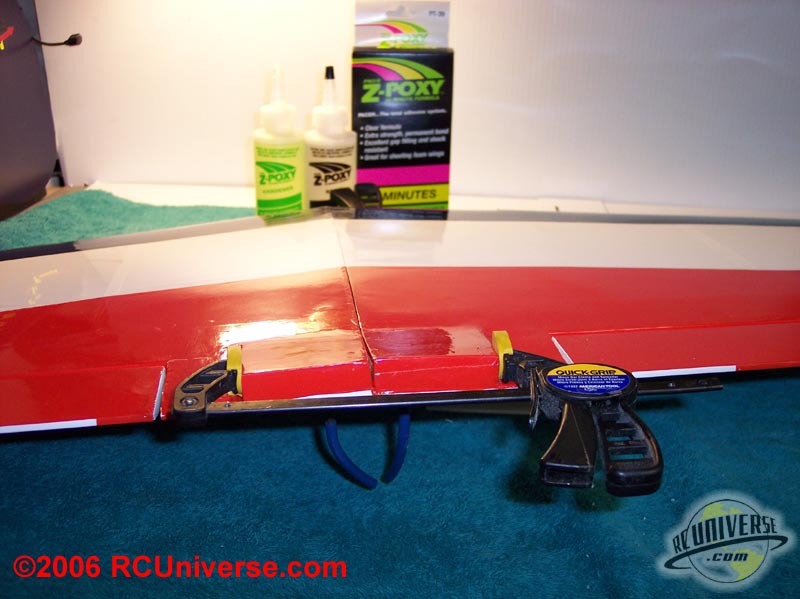 After the epoxy was dry the wing assembly is finished. 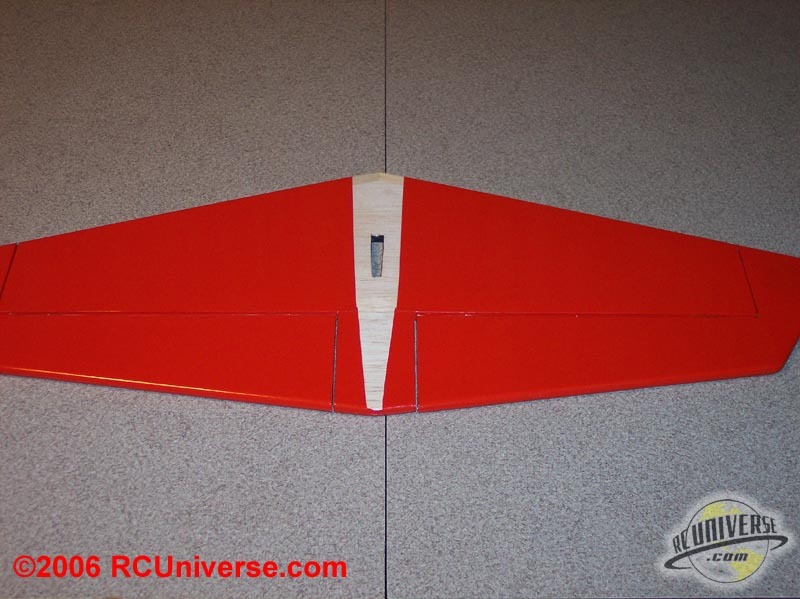 Up next is to mount the servos in the wing, one servo for the flaps and two servos for the ailerons. 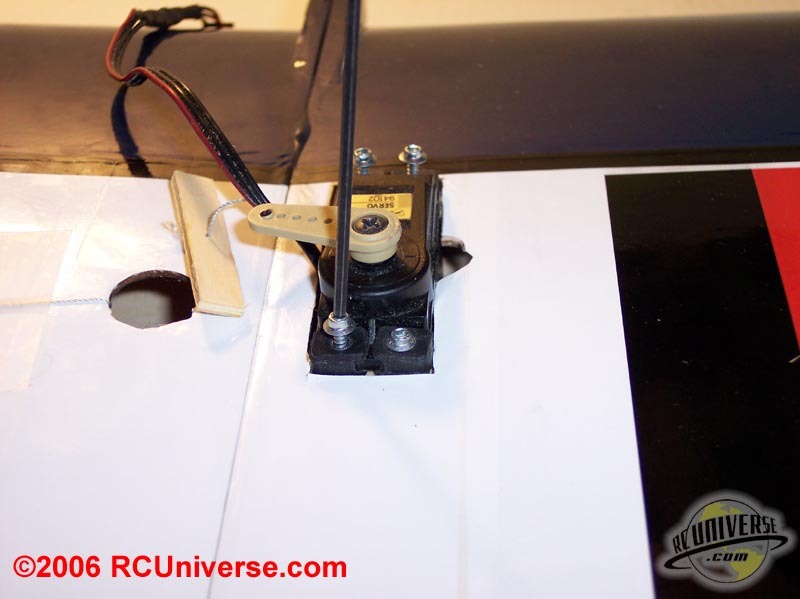 The flap servo is mounted in the center of the wing and uses a Y-pushrod to control both flaps. 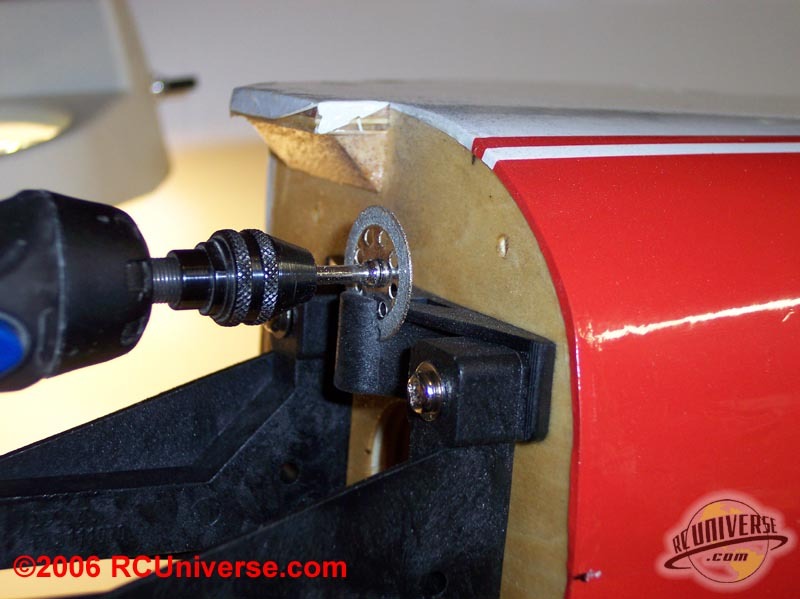 Mounting the flap servo means marking and drilling the mounting holes, cutting the threads in the wood with a screw, and hardening the holes with thin CA. 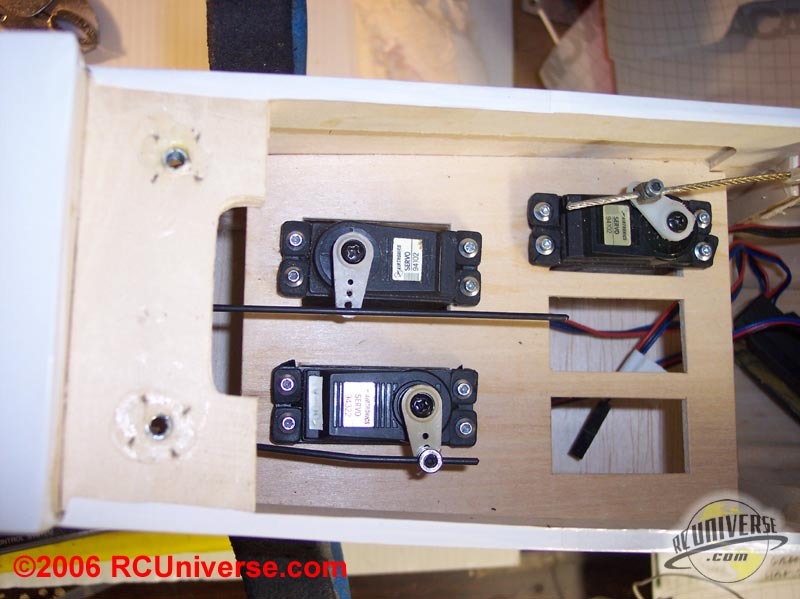 After setting up the mounting holes I mounted the servos in place with #2 x 9/16? hex head servo screws from Micro Fasteners. 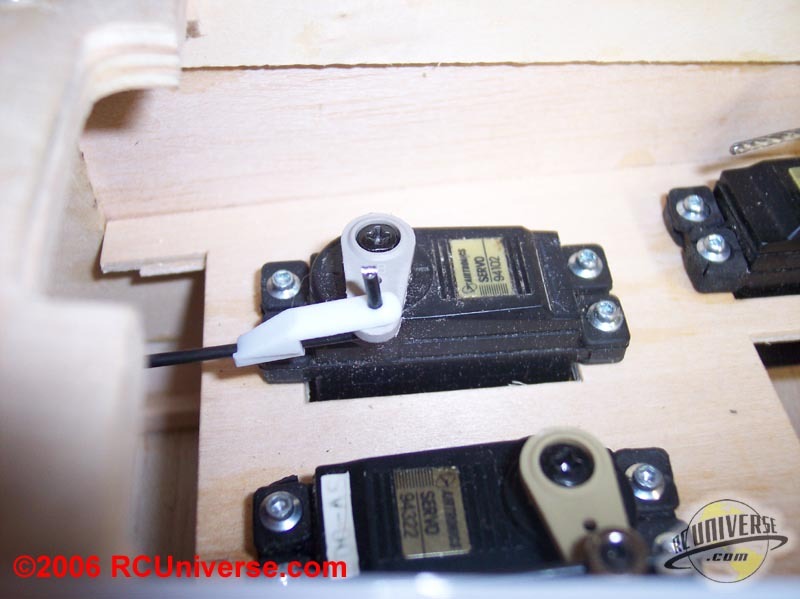 I use these to mount all of my servos because they are much easier to install and remove than regular screws. This is because the hex heads allow for positive control without the tool slipping or damaging the head like it can with a regular screw head. If you don’t already use these I highly recommend that you give them a try. 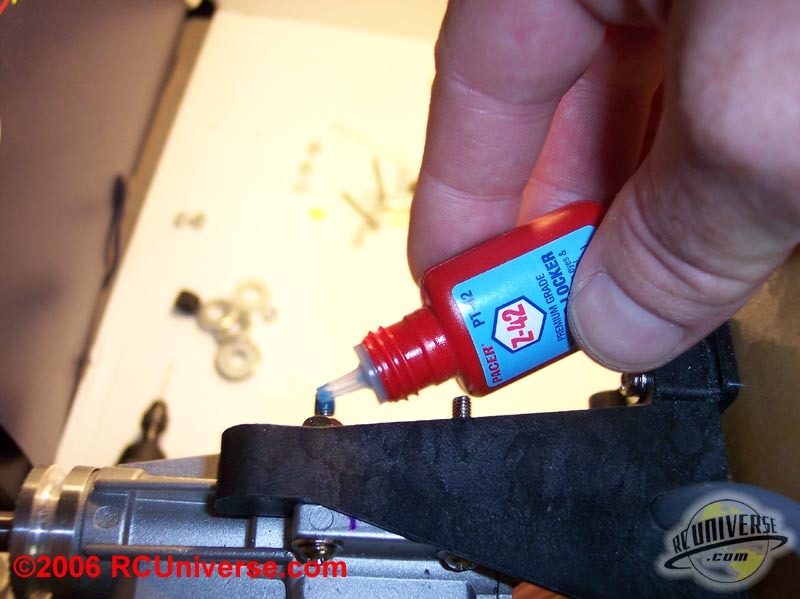 Trust me in that you’ll never use a screw again!! After installing the servo the pushrod needs to be assembled and put in place. 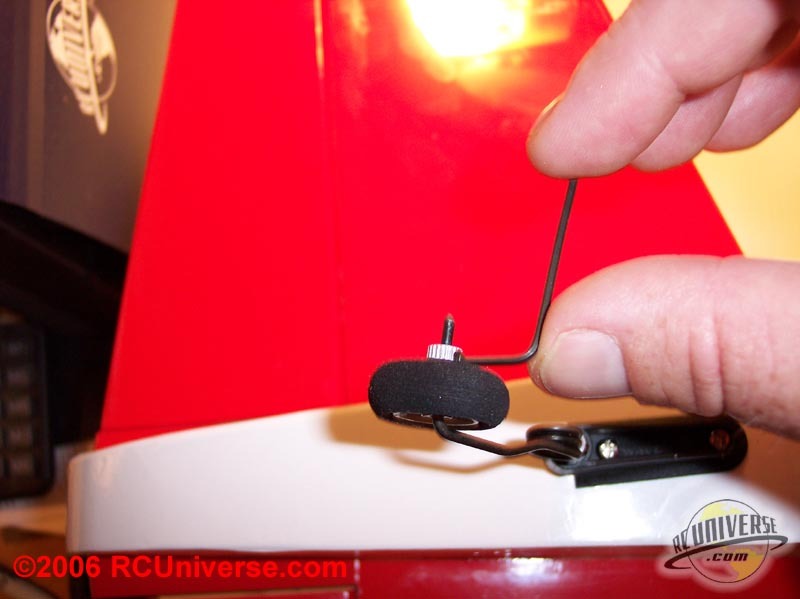 The included clevises have a metal shaft in them which means that they will give you a positive and secure hold on your control horns with no worries of the clevis failing in flight. 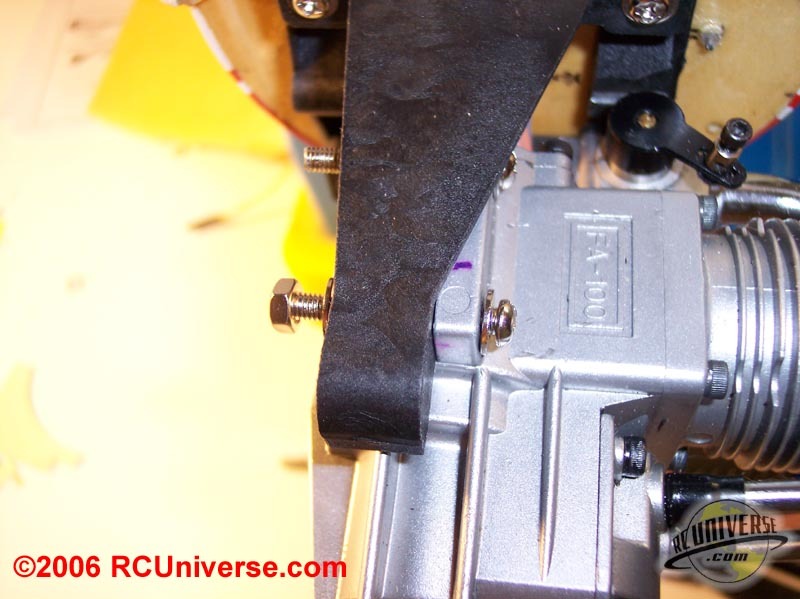 At the flap end there are threaded mounting tabs on each torque rod, and at the servo end the pushrods are held place with the use of a L-bend with a nylon keeper. The mounts for the aileron servos need to be built, but it’s a pretty easy procedure to make them. 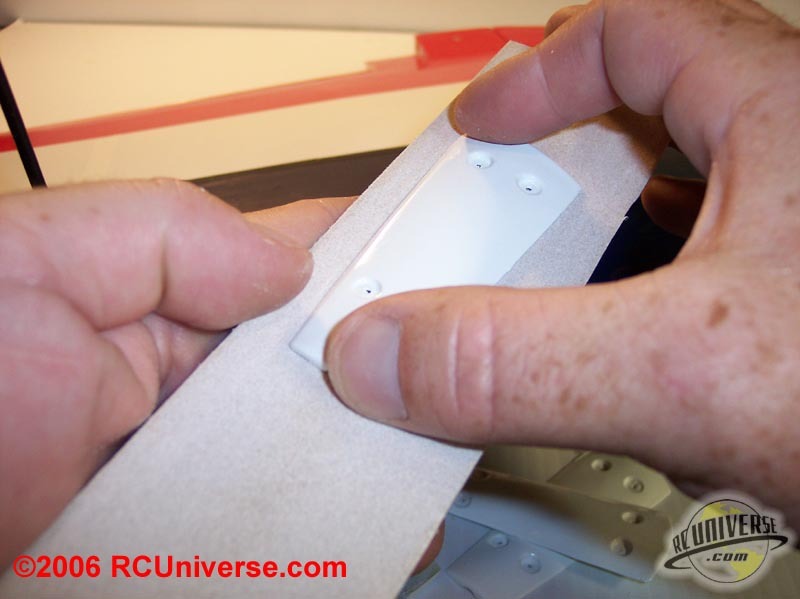 Mark the underside of the aileron hatch for the position of the servo mounts and use epoxy to attach them in place. 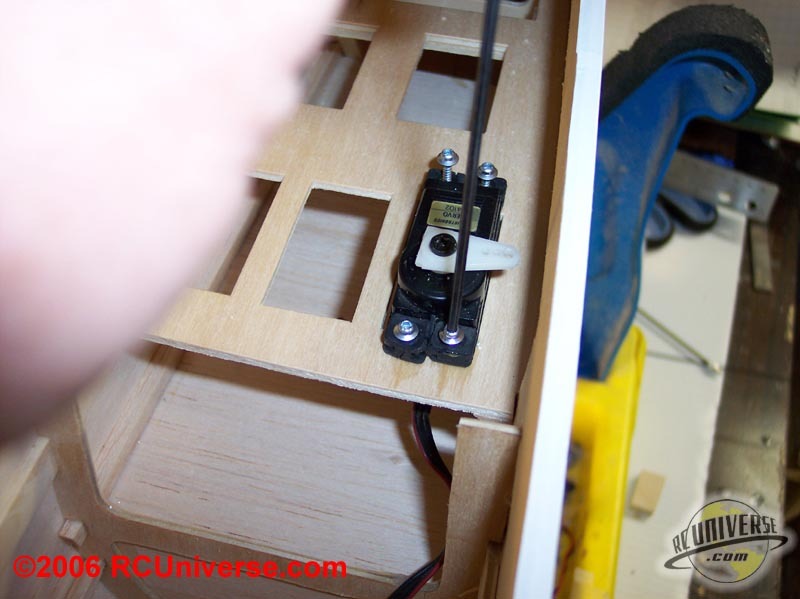 After the mounts are in place I used the hex head screws to mount the servos in place. 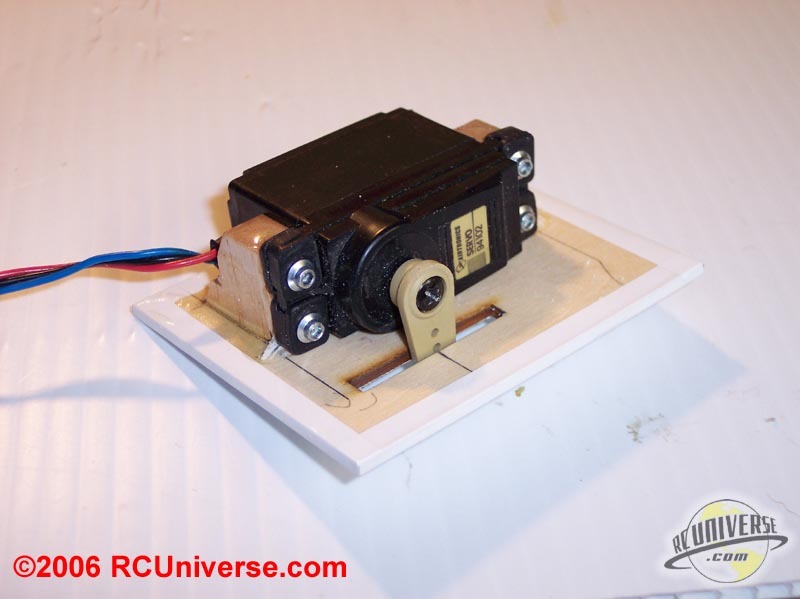 When mounting the servo in place make sure that it’s not laying flat on the hatch surface as this can transfer vibration directly to the servo, which can cause problems to the servo. I was especially pleased with the quality of the control horns included with this plane. 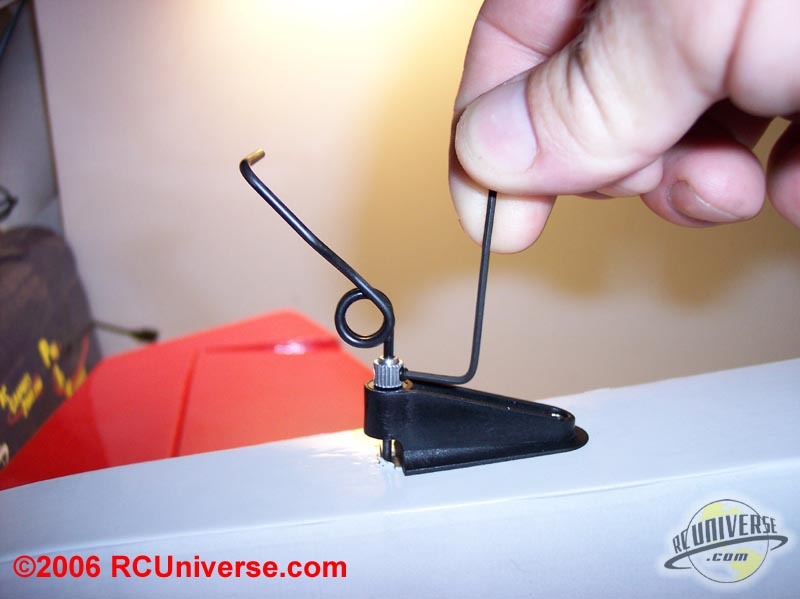 They are made from a very sturdy plastic with metal threads for the mount point to screw on to, and the wide base of the control horn will help to evenly spread out pressure on the control surface. 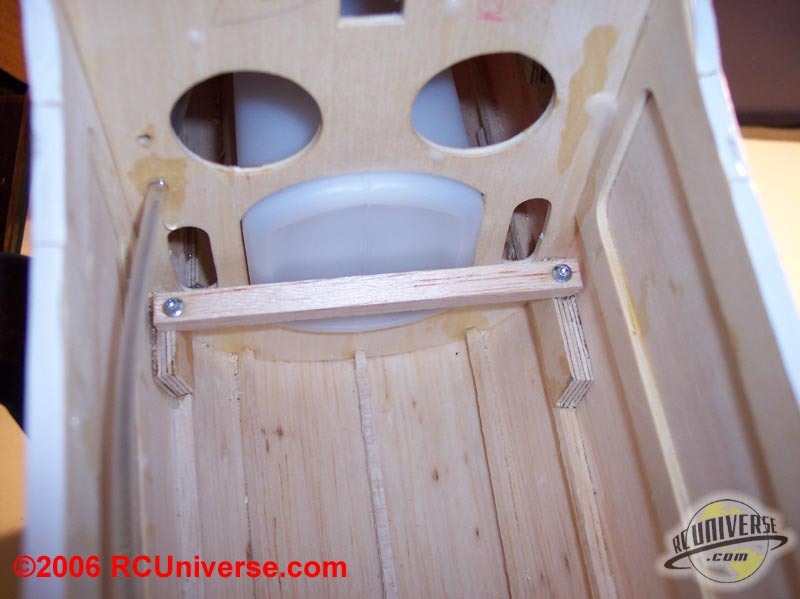 The holes for the control horns are pre-marked to ensure proper placement. 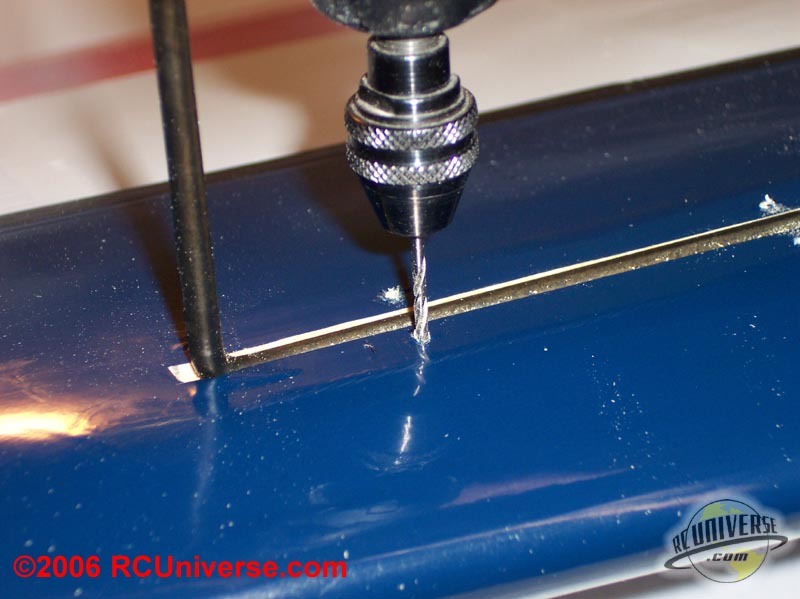 Simply drill the mount holes out and harden the wood with a little bit of thin CA. 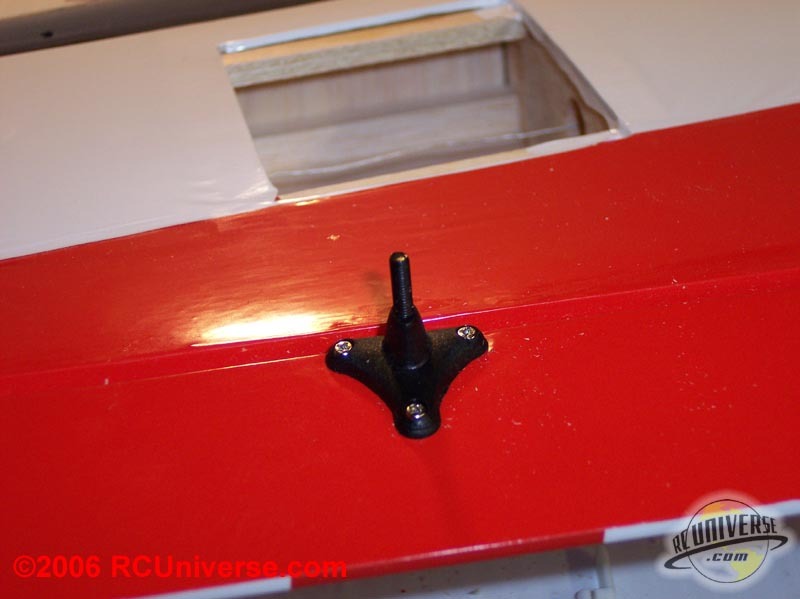 The control horn mounts with a backing plate on the opposite side of the control surface. A silicon keep and a clevis are placed on one end of the pushrod to attach to the control horn, and the opposite end is attached to the servo using a L-bend and nylon keep to hold it in place. With this the assembly of our wing is complete. Very simple and easy enough to do in one evening of work. The landing gear for the Super Chipmunk are made of spring steel music wire and very easy to put in place. 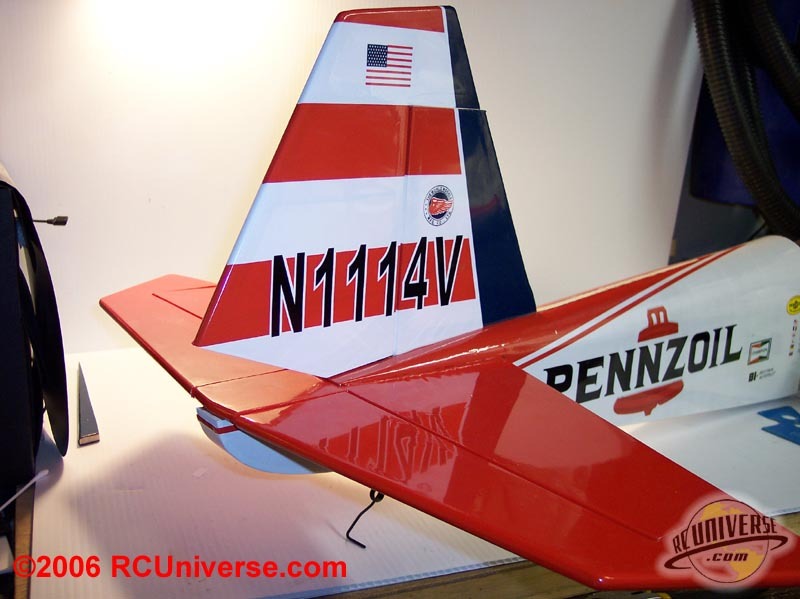 The wheel pants and strut fairings are made of fiberglass and really help dress up the landing gear, making the Super Chipmunk look really sharp. 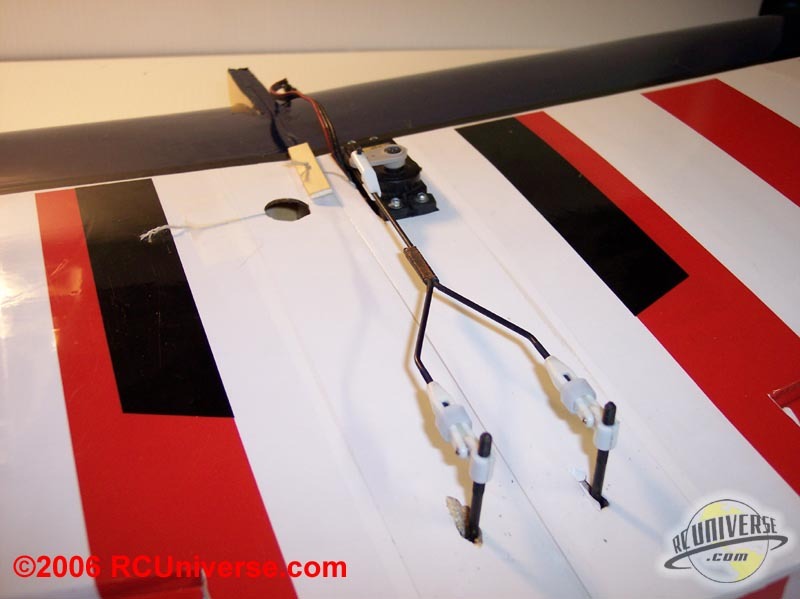 To install the landing gear slide the landing gear wire into place on each wing half and push them firmly into the slot to ensure they are completely seated. 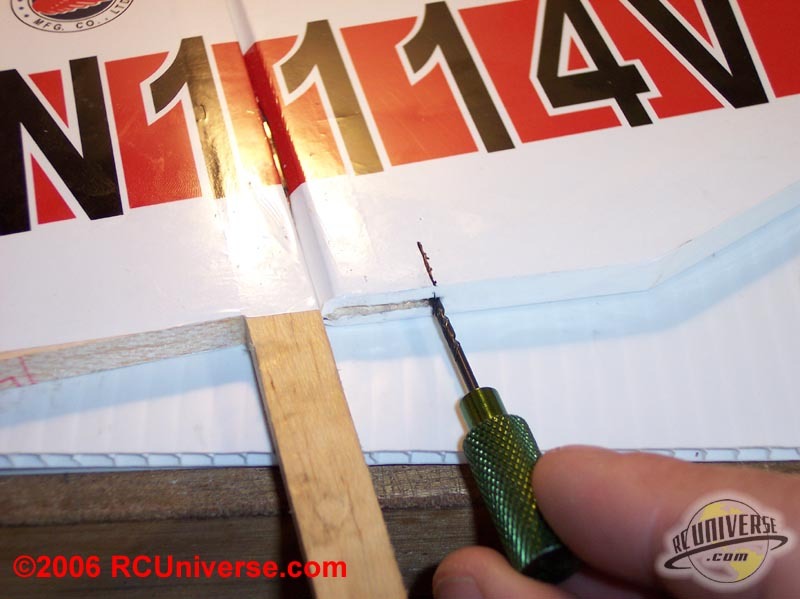 Mark the locations for the retaining straps and drill out the holes with a 1/16? drill bit. 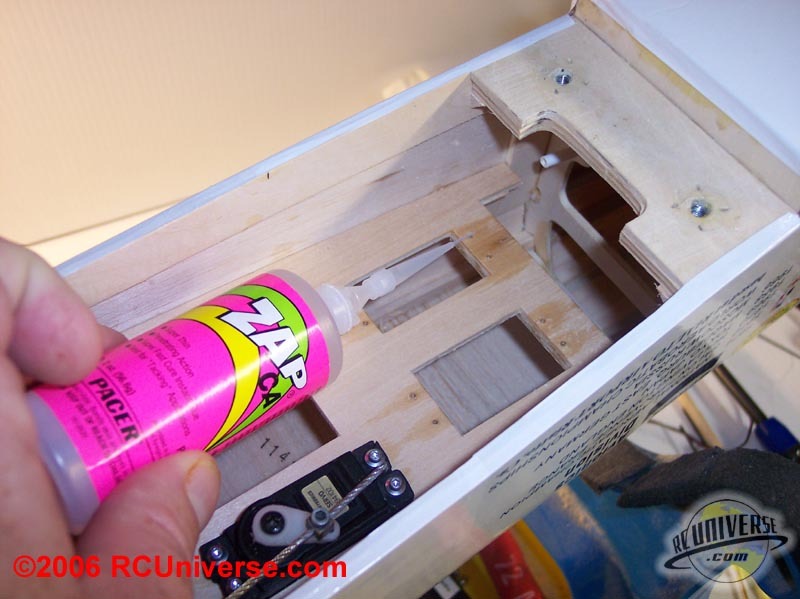 Use a mounting screw to cut threads in the wood and use thin CA to harden the treads. After the CA is dried mount the two retaining straps in place to hold the landing gear firmly in place. 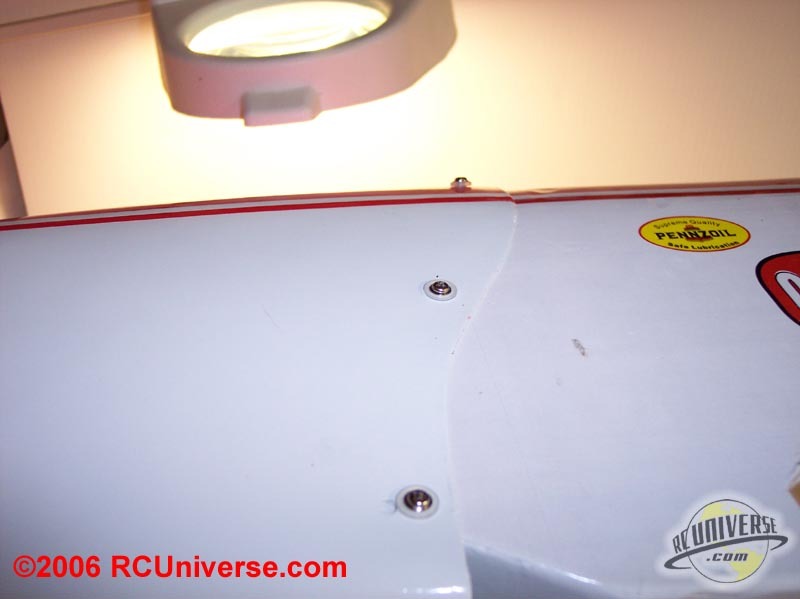 The fairing for the landing gear strut is a two piece fiberglass assembly, with the two halves being held in place by 4 machine screws. 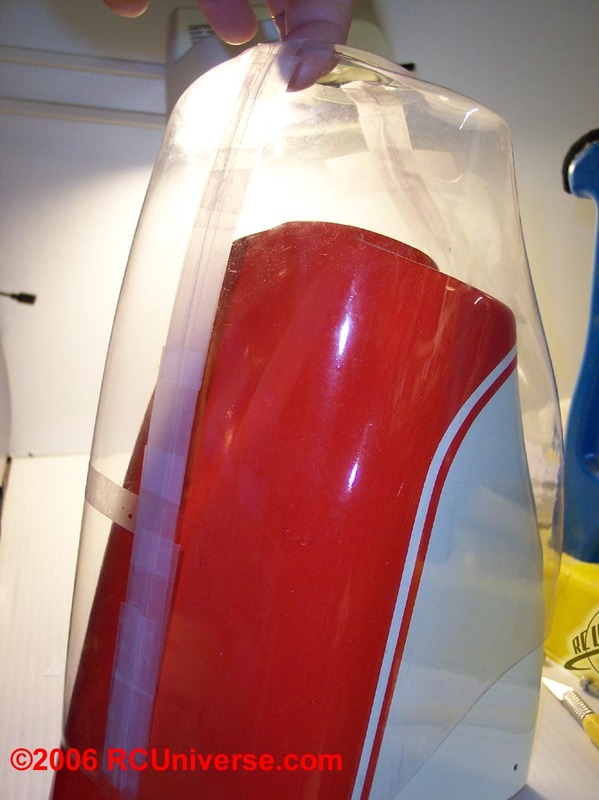 I found that the easiest way to ensure a good fit of the two parts was to use a sanding block to level the edges of each half of the fairing. I used a little bit of blue thread lock on each machine screw to ensure that it wouldn’t come off in flight. 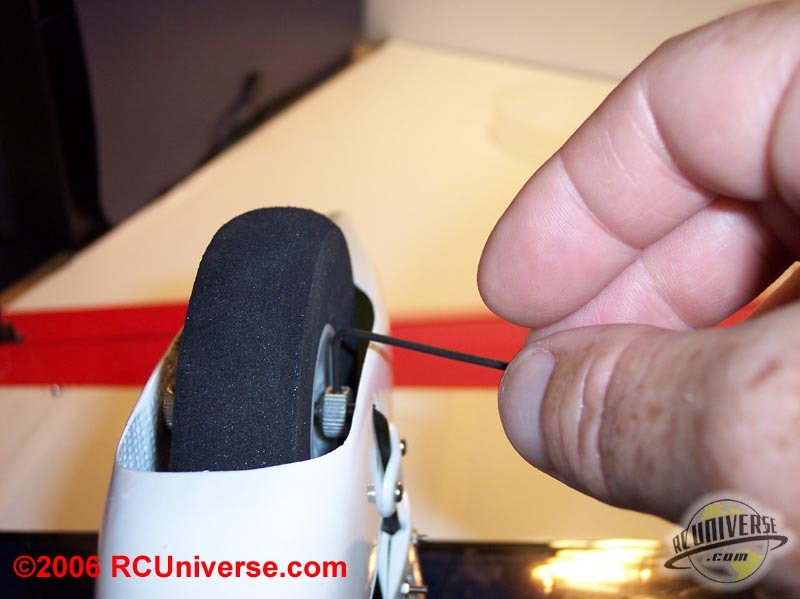 There is a groove molded into the wheel pants that will ensure the proper mounting angle when installed on the plane. To mount the pants first drill a hole at the bottom of that groove. Drill through the fiberglass and then half way through the wood on the opposite side of the pant. This will let the wheel axle anchor to the sides of the wheel pant keeping it in place. The wheel pant is held in place against the landing gear using a nylon retaining strap. 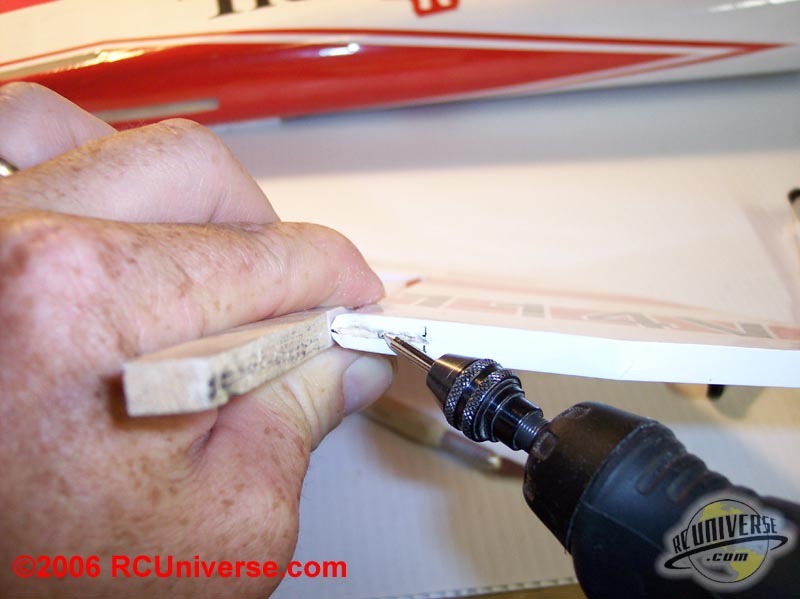 Drill the mount holes and harden them with CA the same way as done on the landing gear. Lastly, tighten the wheel collars to hold the wheel in position on the axle. Probably the most difficult part of assembling this plane is getting the tail feathers put together, although even this isn’t too complicated as long as you take your time. The slots for the horizontal stabilizer are pre-cut and have a wooden plug in it for shipping, which will need to be removed. The first thing to do is to properly position the stabilizer on the fuselage. This is done by first checking the distance from the front center of the fuselage to both outside corners of the horizontal stabilizer. The distance should be the same for both sides. If it’s not then move the stabilizer until it is square. After that we need to check that the stabilizer is level with the wings. Temporarily place the wing on the wing saddle and bolt it in place. 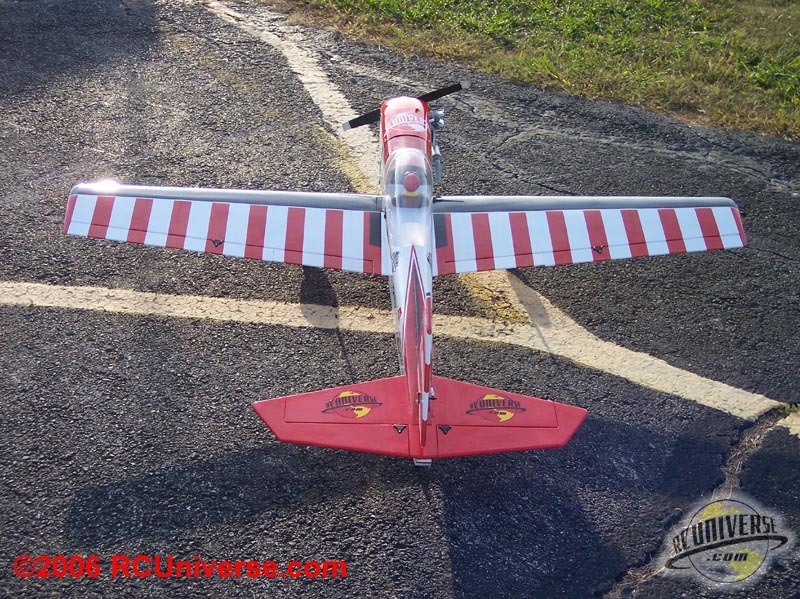 Then step to the rear of the plane and with your eye at the same level as the stabilizer check to see that the stabilizer is level with the wing all the way across the stabilizer. 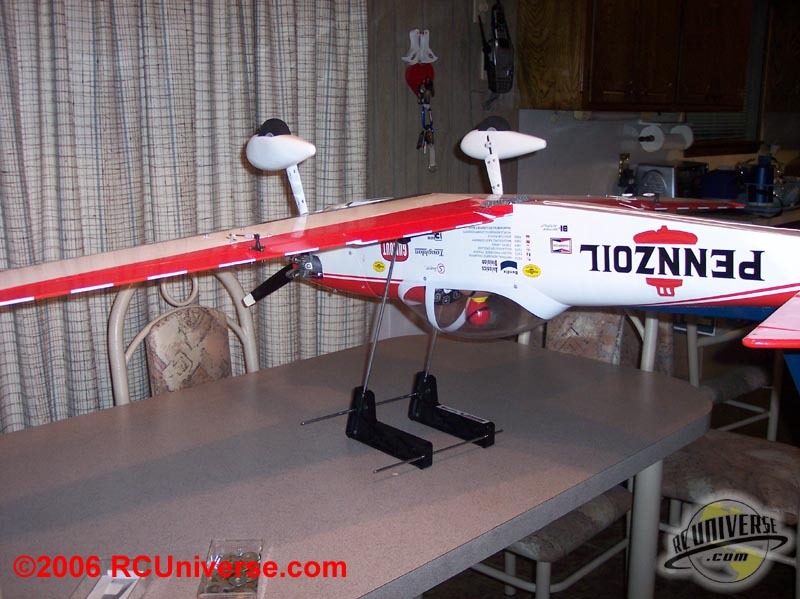 After you are satisfied that the stabilizer is in the proper position carefully turn the fuselage over and mark the mounting position on the stabilizer. After marking the mounting position I wanted to remove a little bit more covering than what was already removed. I prefer more wood surface to mount the stabilizer with. 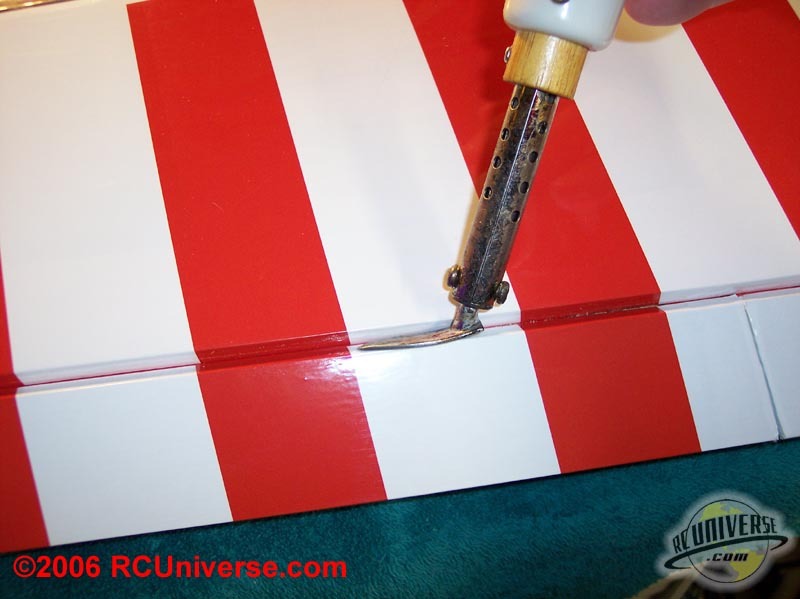 If you need to remove any covering such as this use a heated soldering iron to “melt? the covering away instead of cutting it with a knife, which eliminates any chance of cutting into the wood underneath the covering. 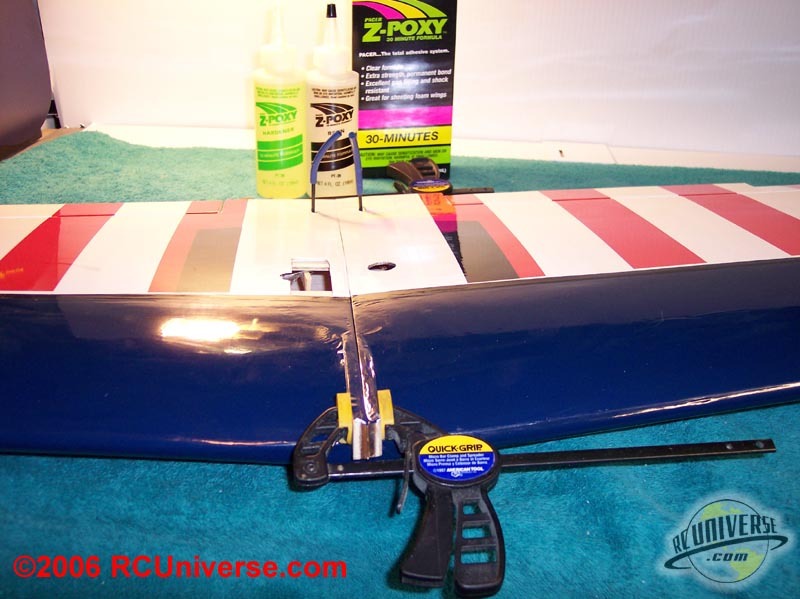 With the covering removed use 30-minute Z-Poxy to secure the stabilizer in place. 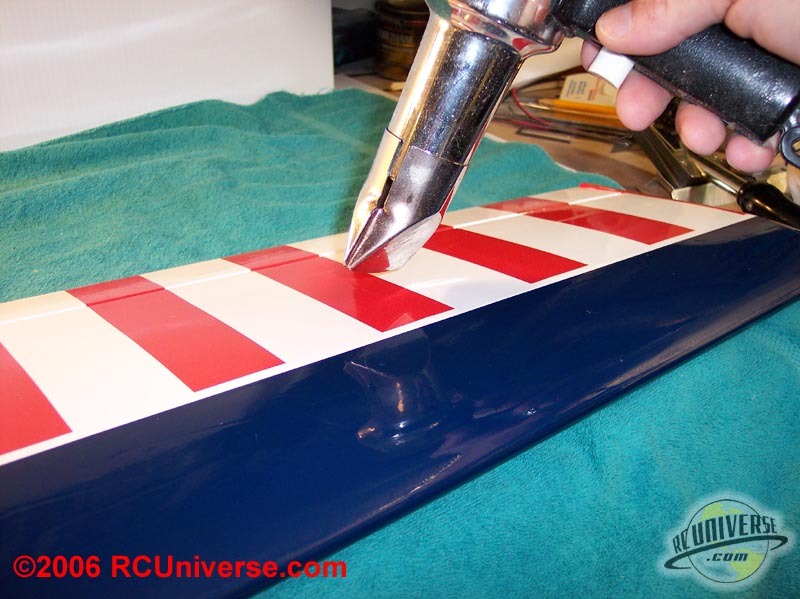 Make sure that the entire saddle area has epoxy applied to it to ensure a good bond of the stabilizer to the fuselage. 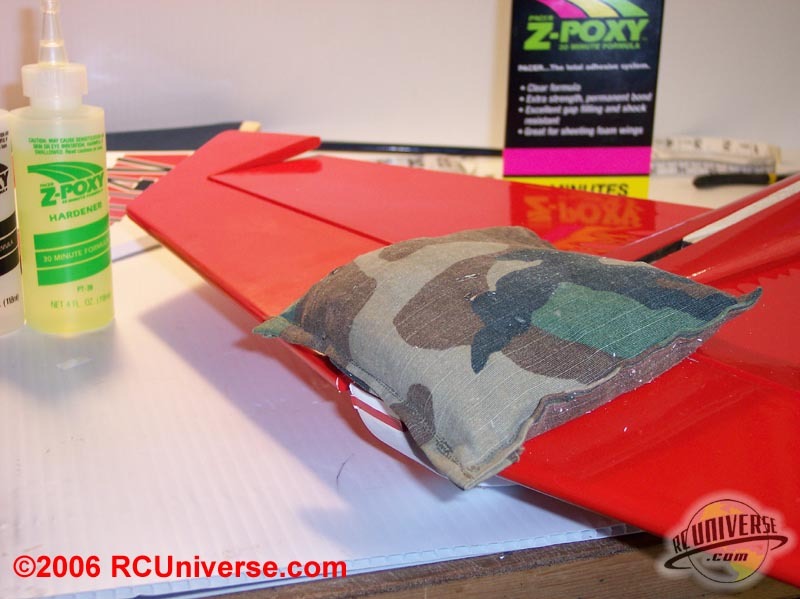 Block the fuselage in place and place weight on the stabilizer while the epoxy dries. With the horizontal stabilizer in place it’s time to install the vertical stabilizer. This is probably the most difficult portion of the entire plane assembly, and this is because of the tailwheel mount. 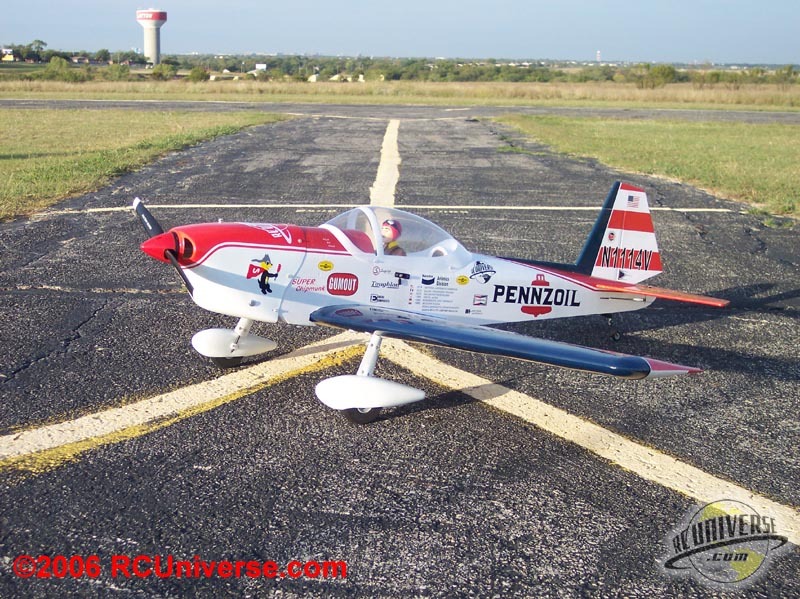 Because of the shape of the fuselage the tailwheel has a rod that extends up through the fuselage and then is mounted into a groove in the rudder. 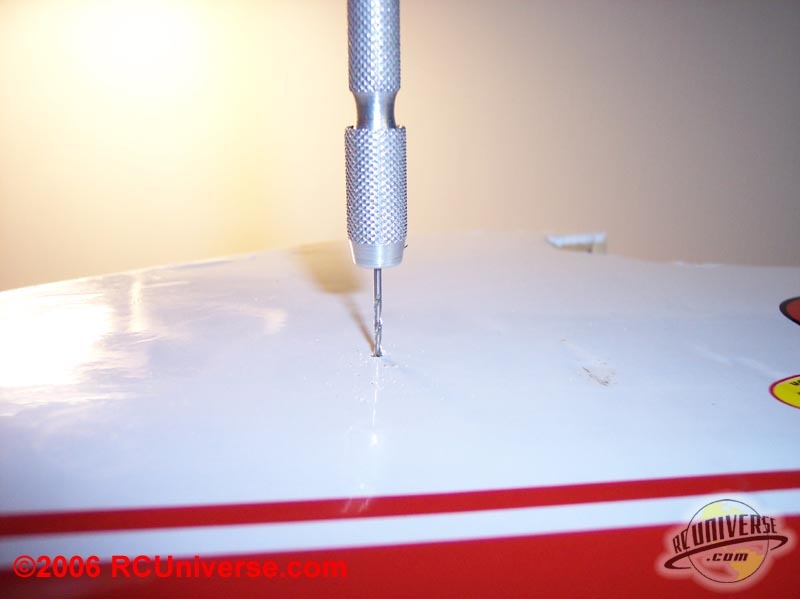 The location of the groove needs to be marked on the rudder. 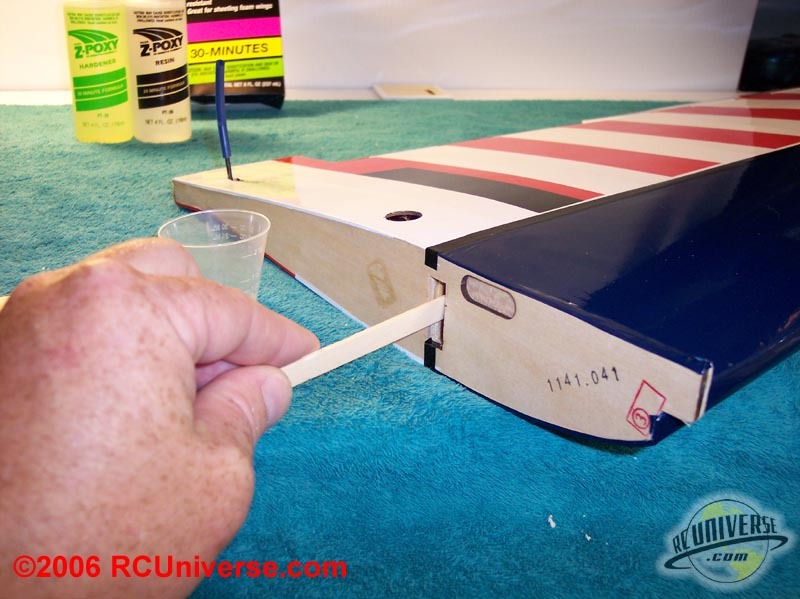 Hold the rod in place and mark the rudder with the location. I used a Dremel tool on slow speed to carve out the groove in the rudder, and then a small drill bit to drill the hole into the rudder. 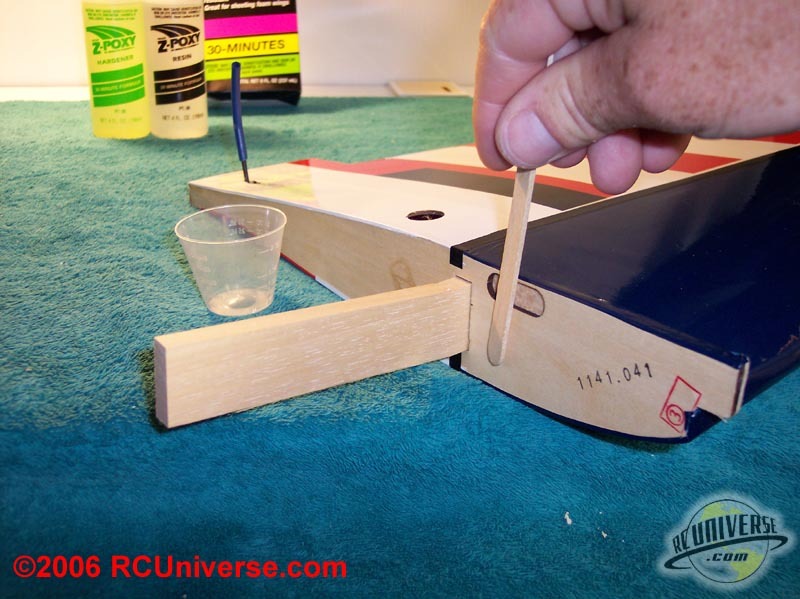 Make sure you double check that everything fits properly and can move freely before applying the epoxy, because you won’t get a second chance here. 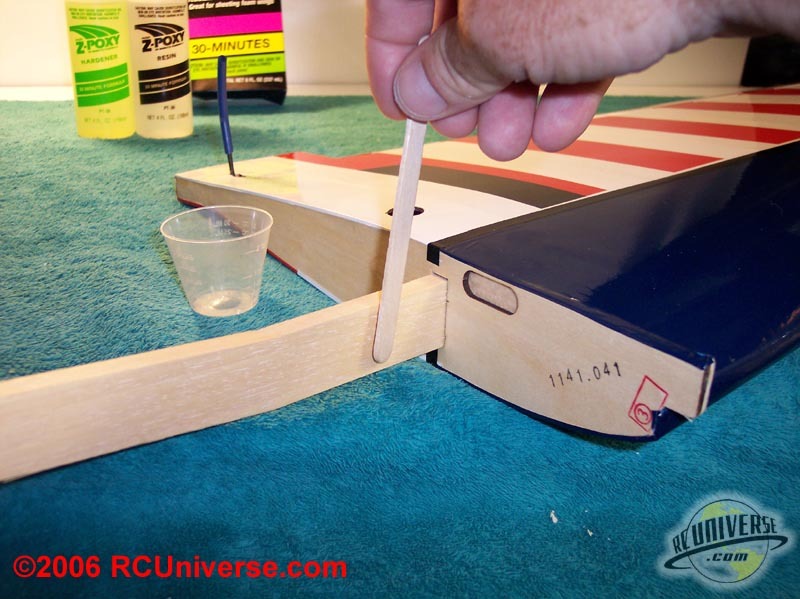 Apply the epoxy to the groove in rudder and to the exposed wood of the vertical stabilizer, and then slide the vertical stabilizer into place on the fuselage. 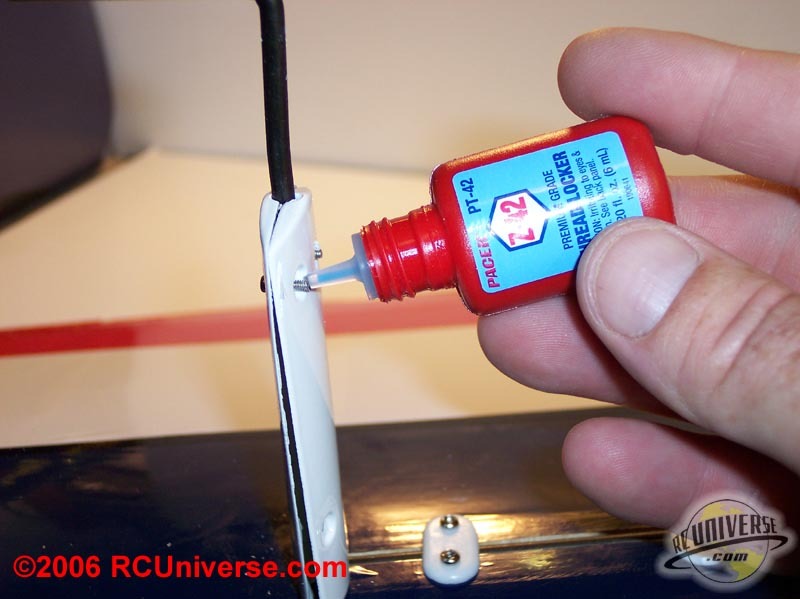 It would help to put a small piece of plastic sheeting or wax paper on the top of the elevator so that the epoxy on the rudder steering rod doesn’t get glued in place. 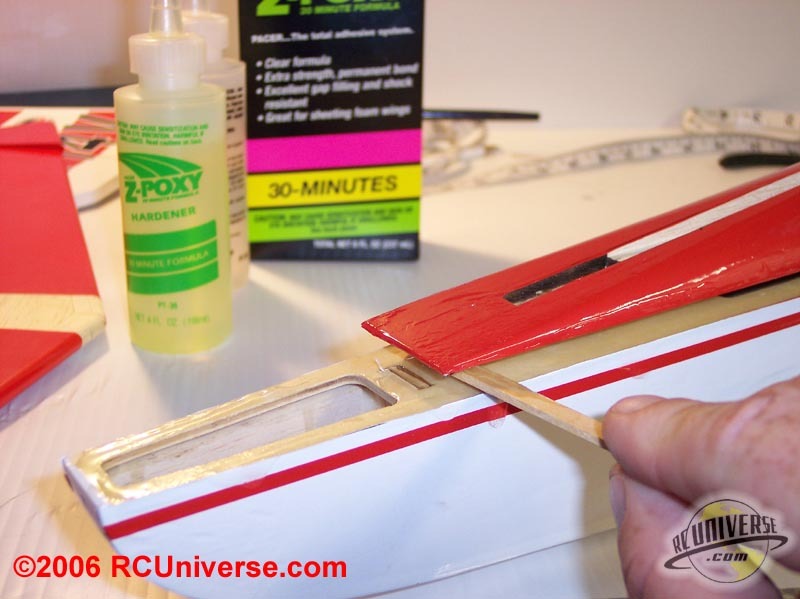 Use a square to ensure that the stabilizer is properly mounted on the fuselage and hold it in place with masking tape until the epoxy dries. 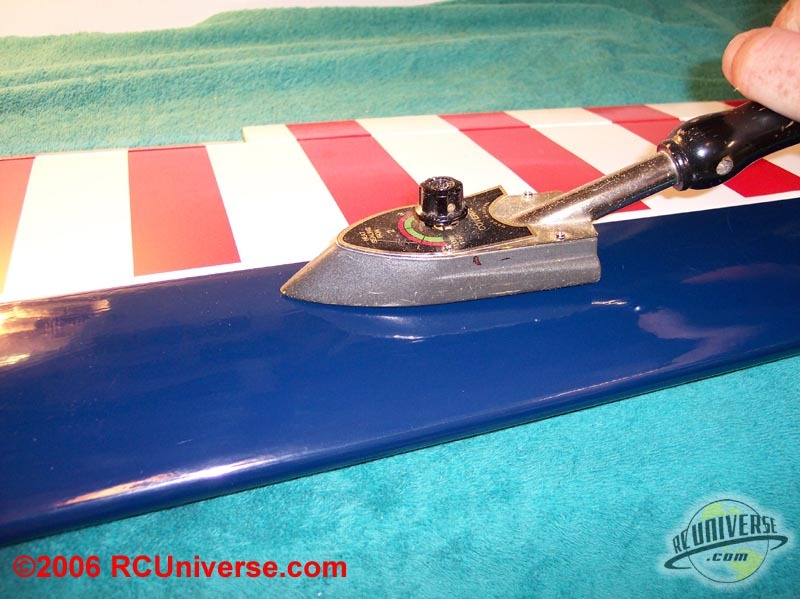 After the epoxy has dried the forward part to the vertical stabilizer needs to be epoxied in place. The last part of this portion of the assembly is to finish up the tailwheel installation. 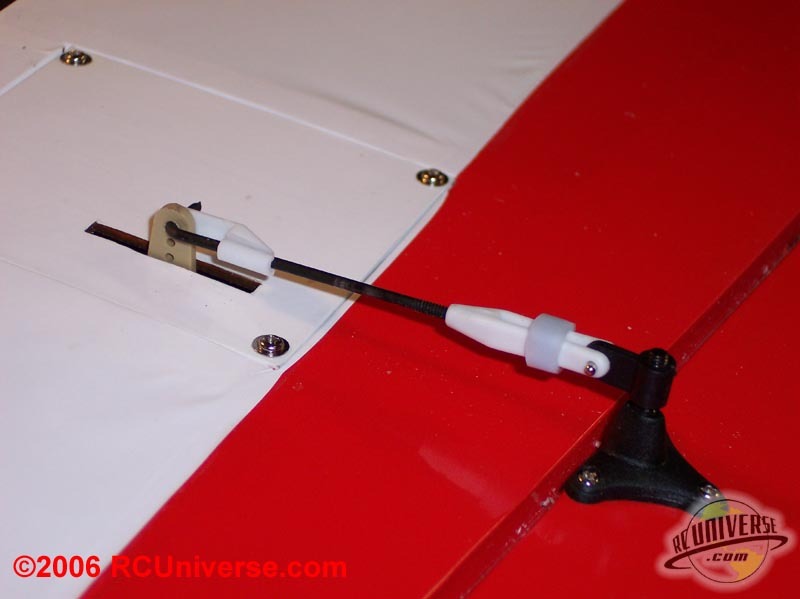 The tailwheel mount is held in place on the fuselage with a wood screw. 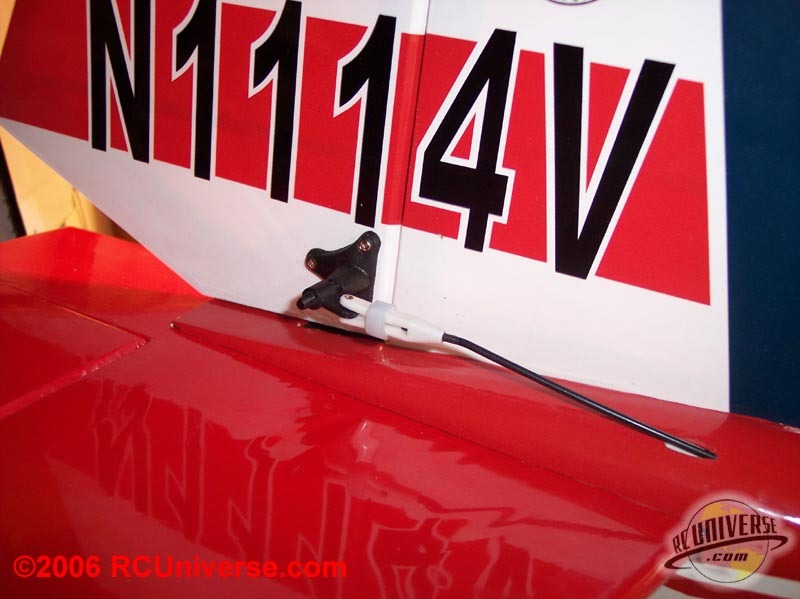 Tighten up the collar on the tailwheel shaft to hold it all in place. Last install the tailwheel using the included wheel collar. The included fuel tank is pretty straight forward to assemble. It’s put together like most every other tank on the market today. You have a choice of making it a 2-line tank or a 3-line tank, depending on how you want yours set up. Since I was planning on using a fuel dot for my fill line I chose to set up the tank as a 3-line setup. When I set up a fuel tank like this I prefer to install an internal line and an extra clunk on the 3rd line. This allows me to pump fuel out of the tank using the fill line. 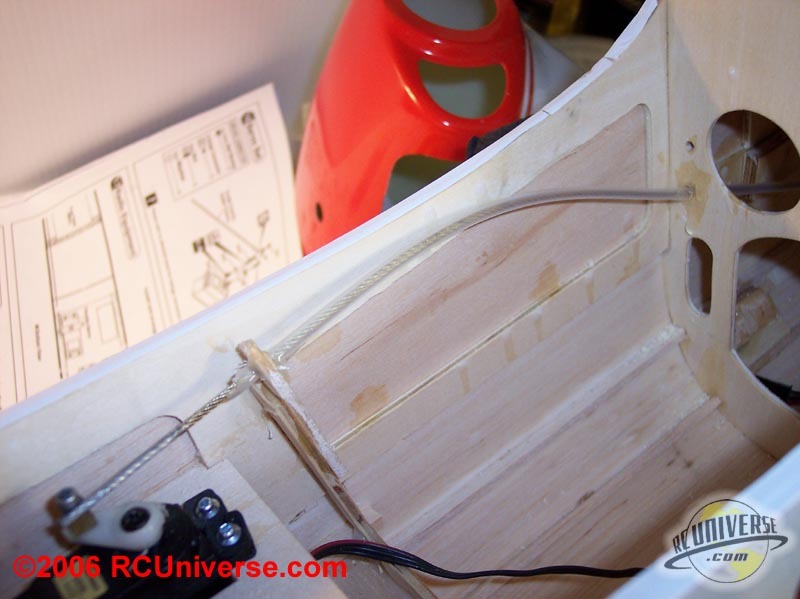 Once the tank is assembled it will slide into the fuselage using the cutout in the former to hold the tank in place. Once inside the fuselage the forward end of the tank will be secured by pushing the neck of the tank into the hole cut in the fuselage. 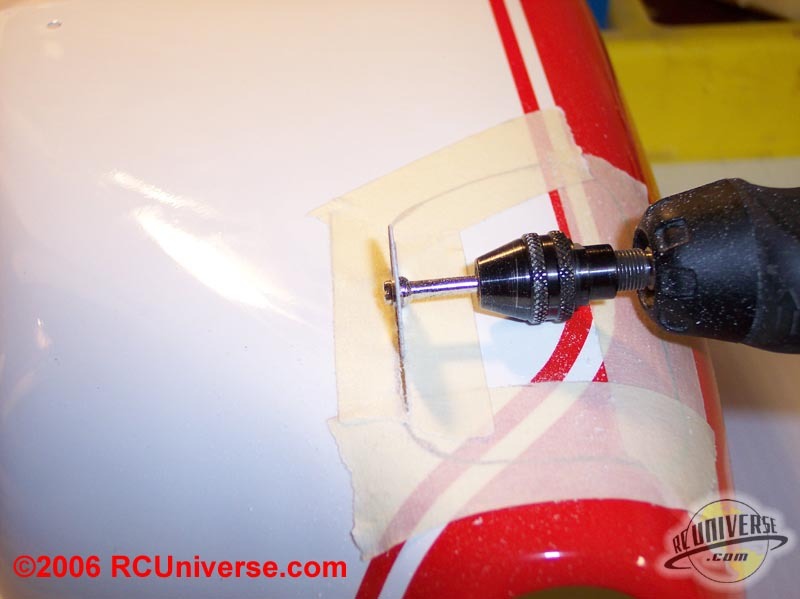 The rubber stopper on the tank will seal this hole against any exhaust residue from getting into the fuselage. 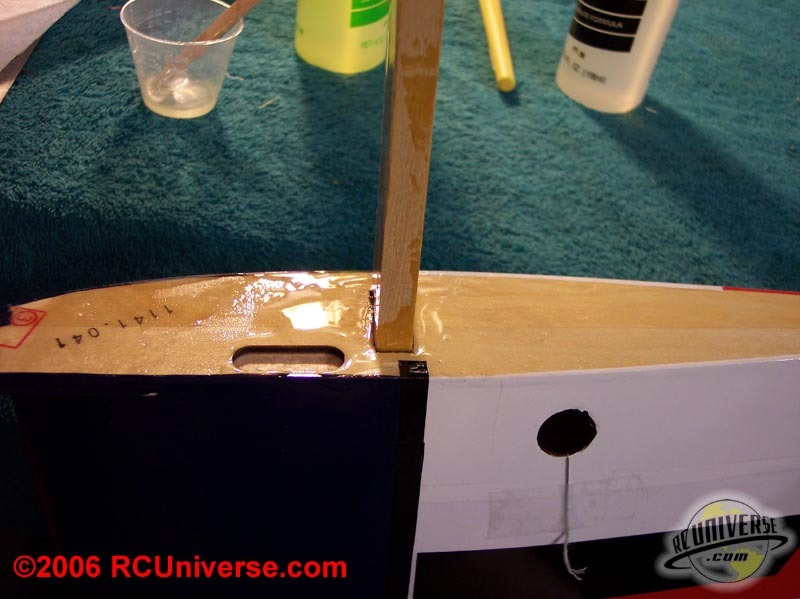 The instructions call for gluing a piece of wood across the back of the tank to hold it in place. I didn’t want to do this because I prefer to be able to remove fuel tanks to perform maintenance on them. So instead of gluing the wood in place I choose to make a couple of mounts out of scrap wood and then securing the wood brace using hex head screws. This will let me take the tank out in the future if I need to. The final part of the tank install was putting in the fuel dot for the fill line, although this isn’t actually completed until the cowl is installed. 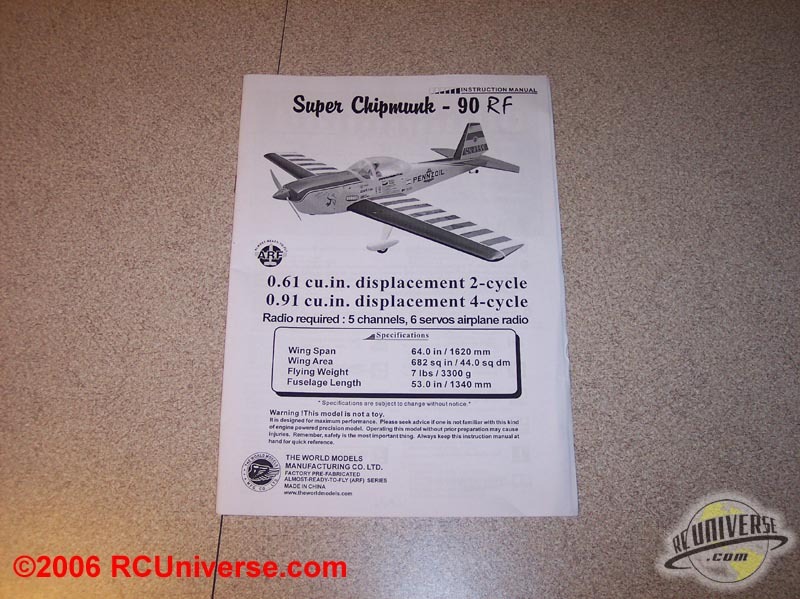 The Super Chipmunk RF is built as a “60? size plane, and my initial thoughts were to use an OS 60 FX I have to power this plane with. But over a cup of coffee with a flying buddy he suggested that I use the Saito 100 I had. My initial concerns were that the Saito was going to be heavier than the OS was, and this would cause problems with the balance of the plane. But after I researched the weights of both engines I discovered that the Saito 100 was actually just a tad lighter than the OS. So this became a “no-brainer? as to what engine the Chipmunk was going to get. 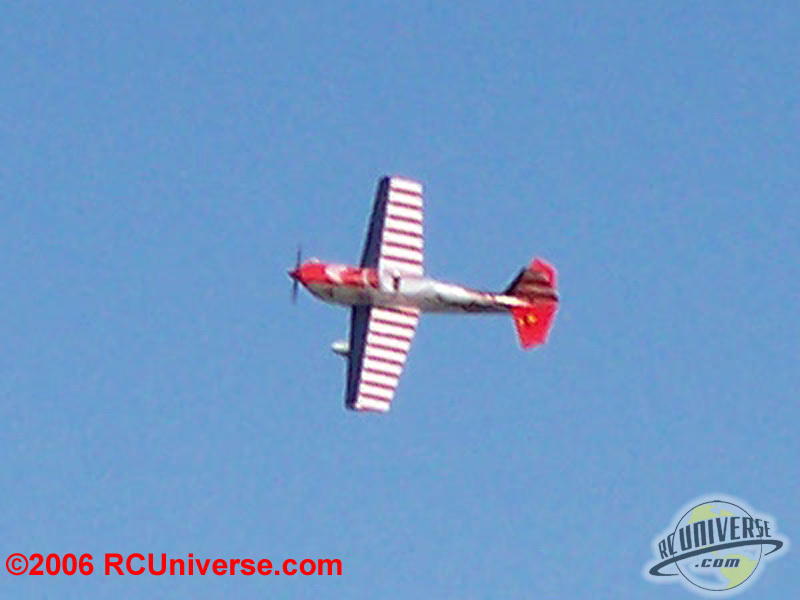 The performance of a Chipmunk just begs for the pulling power of a 4-stroke! The firewall comes with the blind nuts for the motor mount pre-installed as well as the access hole for the fuel tank and fuel lines. 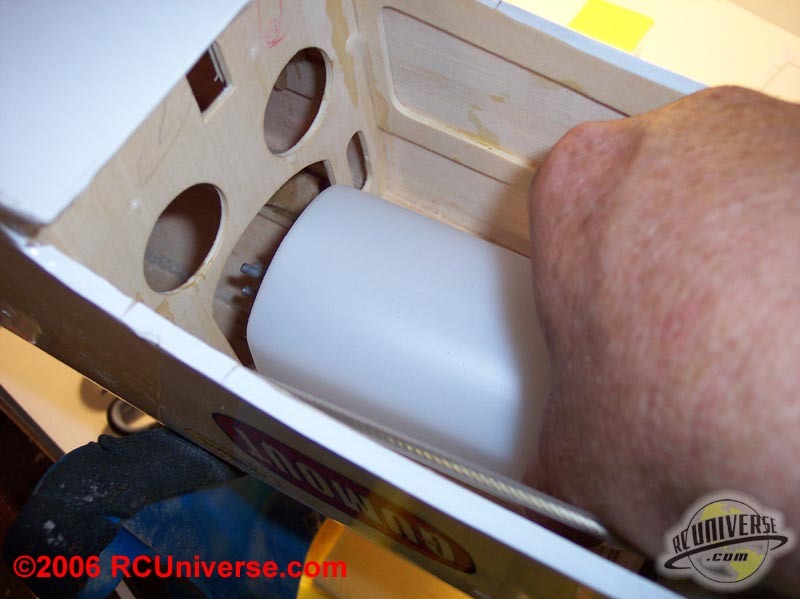 Prior to installing the motor mount I used 30-minute epoxy and a heat gun to fuel-proof the firewall. I also made sure I “painted? the edges of the covering to seal them down and to keep exhaust and fuel residue from “creeping? under the covering. World Models includes an adjustable motor mount, so it can be used for a wide variety of engines. 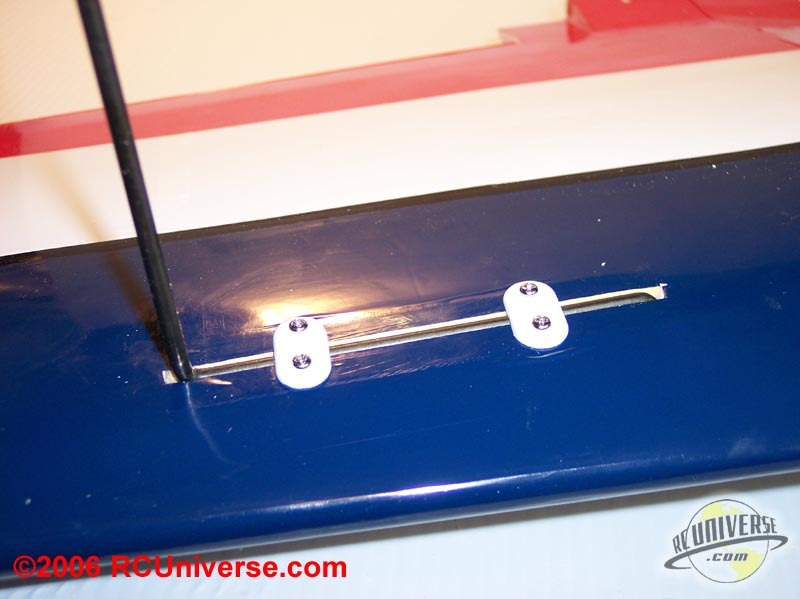 I used blue threadlock on the mounting bolts to keep them from loosening up during flight. The instructions call for placing the spinner backplate on the engine and using this as a guide for positioning the engine on the mounts. The distance from the firewall to the backplate should be 125mm (4.92 inches). Because the Saito engines have the carburetor behind the cylinder head it was impossible for me to get the engine to mount where the instructions called for. My goal was to get the engine as far back on the motor mount as I could in order to lessen the effects on the balance of the plane. On the motor mount there is a “bump” that extends out about 3/8? from the mount. I used my Dremel tool to cut this off which let me move the engine back a little bit more. I still wasn’t able to get the engine to the distance called for in the instructions, but I got it as close as I could. 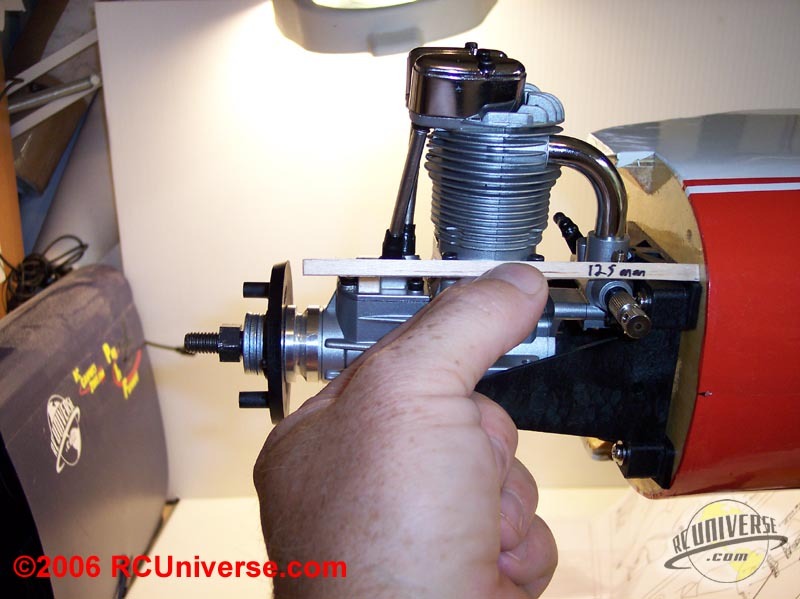 The plane comes with the exit for the throttle pushrod tube pre-drilled, but because of the location of the carburetor I wasn’t able to use that position. I need to drill a new exit for the throttle pushrod. If you need to do this for your plane make sure that the new pushrod position isn’t going to interfere with your fuel tank. Next up was to drill the motor mount in order to bolt the engine to it. I used some blue threadlock on the mounting bolts to keep them from coming loose during flight. 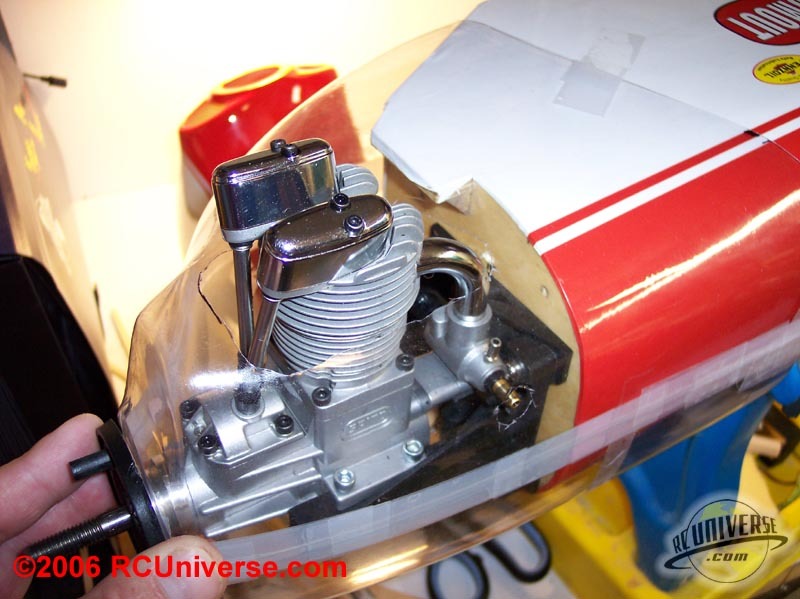 As with most 4-stroke engines the Saito has a crankcase vent tube that needs to be installed. This vent should run out of the engine cowl as there will be excess fuel that will run out of it during flight. I choose to route mine out the rear of the cowl on the underside of the fuselage. A couple of strips of styrene plastic folded over work great as tube clamps to hold the vent tube in place. Last up was to run the throttle pushrod. Because we had to change the position of the pushrod exit on the firewall I also needed to drill a new hole in the fuselage former to keep the pushrod tube from kinking in the tube. 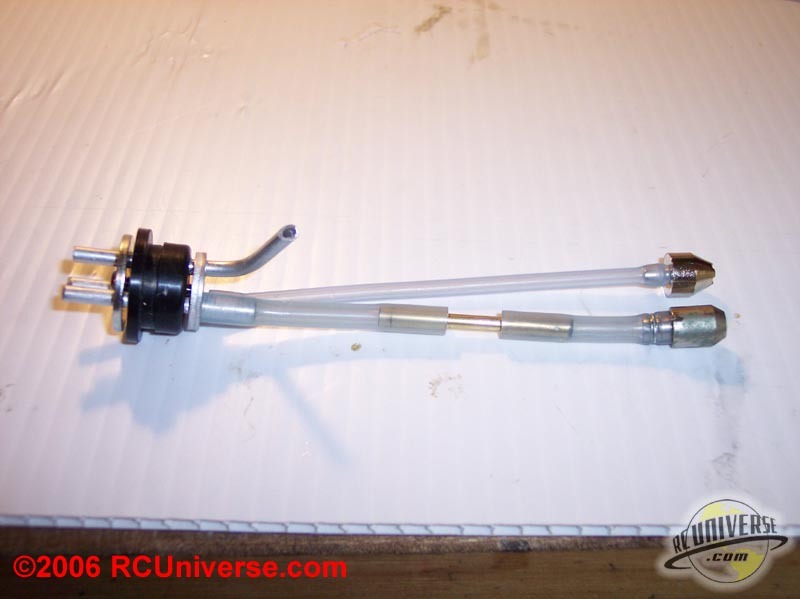 Because of the new route the stiff pushrod tube included with the kit wouldn’t work any longer. I replaced the stock pushrod with braided steel wire, soldering both ends to keep the braids from fraying. 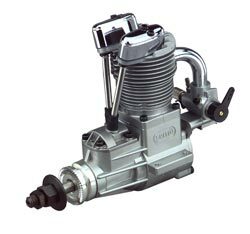 The FA-91 is one of the most popular selling engines in Saito’s extensive line of four-strokes. The .91 fits perfectly into most airplanes designed for .60-size two-strokes offering the ability to swing larger diameter props with more thrust than the two-stroke. Many pilots simply prefer the powerful sound of a four-stroke. Now Saito is offering a new engine that offers even more power than the .91 but that’s similar in size and weight. Saito’s new FA-100 will turn an APC 14 x 8 prop 300 to 700 rpm more than either the Saito .91 or O.S. .91. At only 19.2 ounces (less muffler), it weighs nearly 2 ounces less than the O.S as well! The Saito FA-100 is not just a punched out .91. It features a newly tooled case that shares the mounting dimensions of the O.S. 91. This allows it to be used with the many after-market engine mounts already available to fit this engine. The Saito 100 will use a wide range of fuels. It is suggested to break them in with a fuel containing 20% oil, which I did, but then I switched to 15% Cool Power. One very nice touch with this plane is the included cowl overlay. 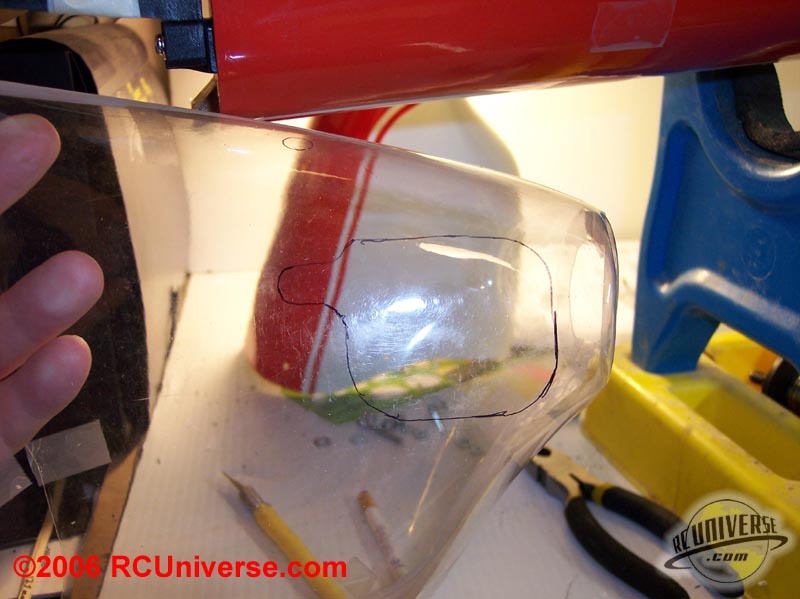 This is a clear plastic “cowl” that you can use to get the placement of your openings before you start cutting the actual cowl. 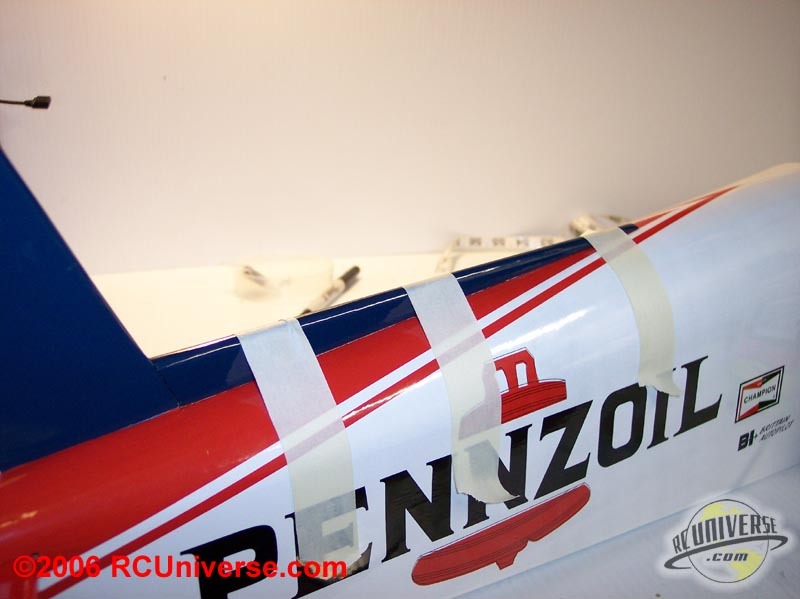 Using the overlay, find the position of your cowl openings and make sure they are correct in their placement, and that you can still get the cowl on and off of the plane. 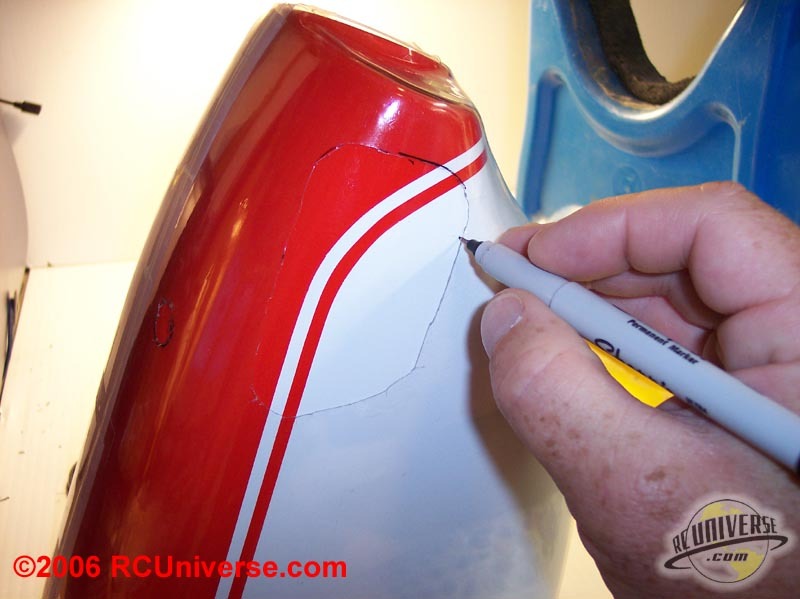 Once you have your openings placed, put the overlay on top of the cowl and mark the locations of your openings. 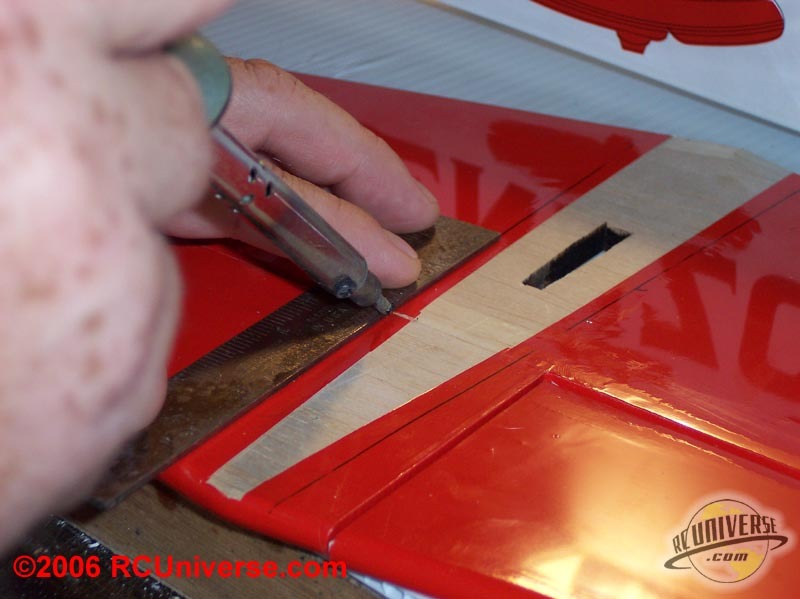 To keep the fiberglass from chipping as you cut the openings cover the area you are going to cut with masking tape before cutting. I used a Dremel tool with a diamond cutting wheel to cut the opening, but any cutting wheel should work. 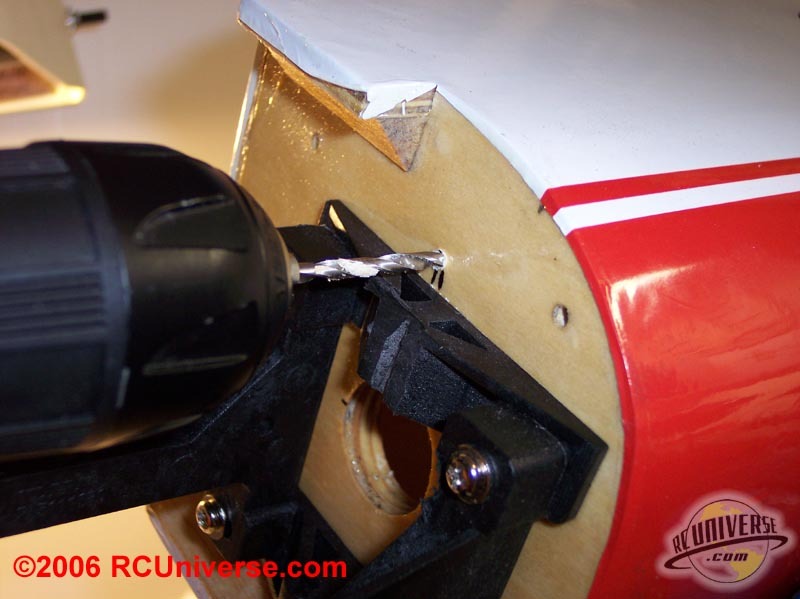 Use some small pieces of scrap wood to get the correct distance between the spinner backplate and the cowl. A small drop of thin CA will hold them in place on the back of the spinner as you position the cowl, but will pop right off when you done. 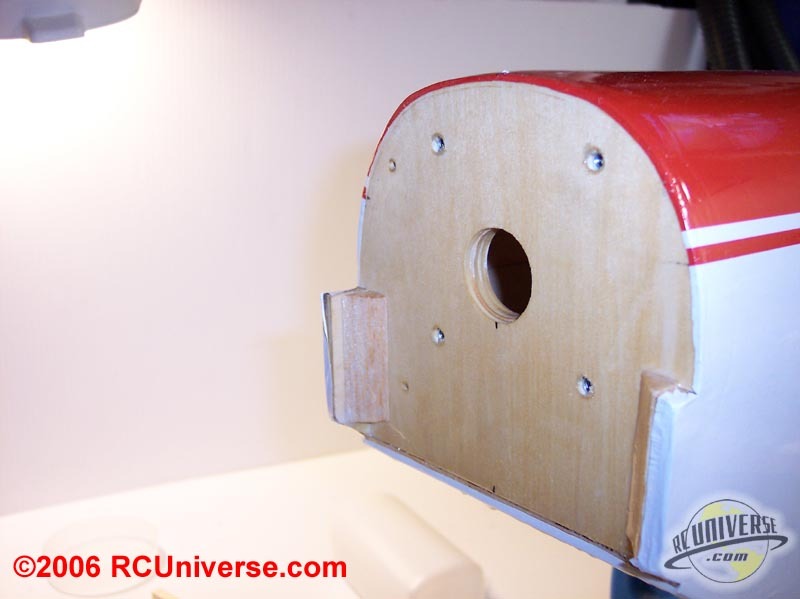 With the cowl set in place the mounting holes are marked, drilled, hardened with CA, and the cowl can be mounted in place. 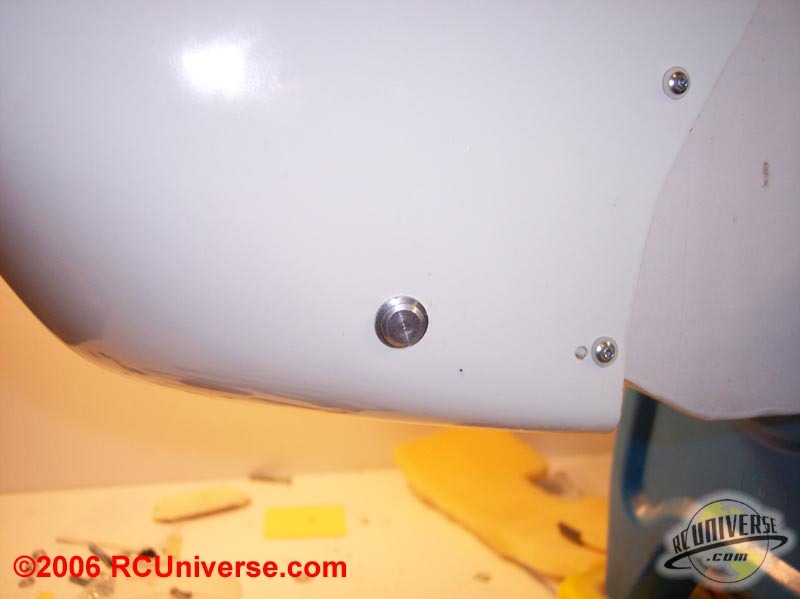 With having to move the engine forward to fit on the plane I ran into a small problem with the mounting holes, which are pre-drilled in the cowl. With moving the cowl forward the bottom hole on the cowl would no longer mount into the fuselage. Because of this I needed to drill a new mounting hole approximately 1/8? behind the original hole. Because I planned on using a larger prop with the bigger 4-stroke engine I had to modify the spinner in order for it to fit. The spinner needed to be carved out in order to fit the 14×8 prop that I was going to use on this plane. I had to remove quite a bit of plastic for it to fit, but the end result let me use the included spinner for this plane. 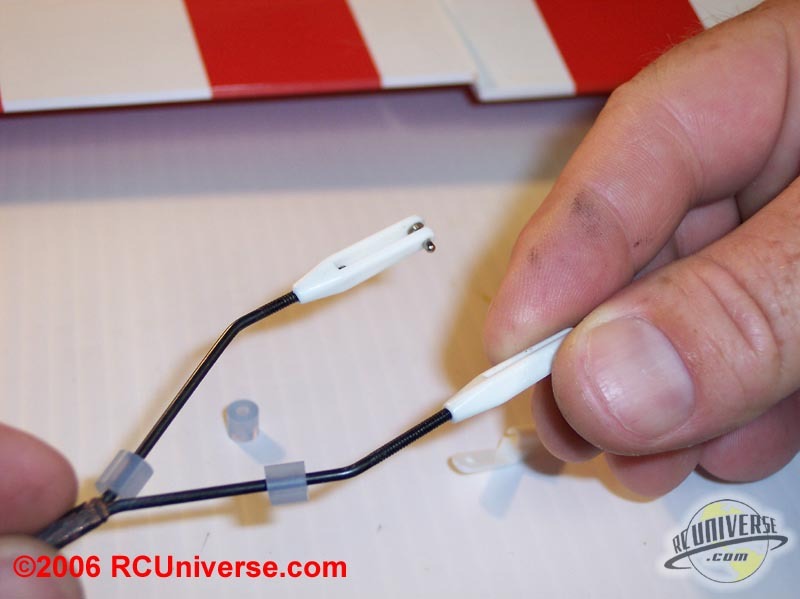 The pushrods for the elevator and rudder are two different types. 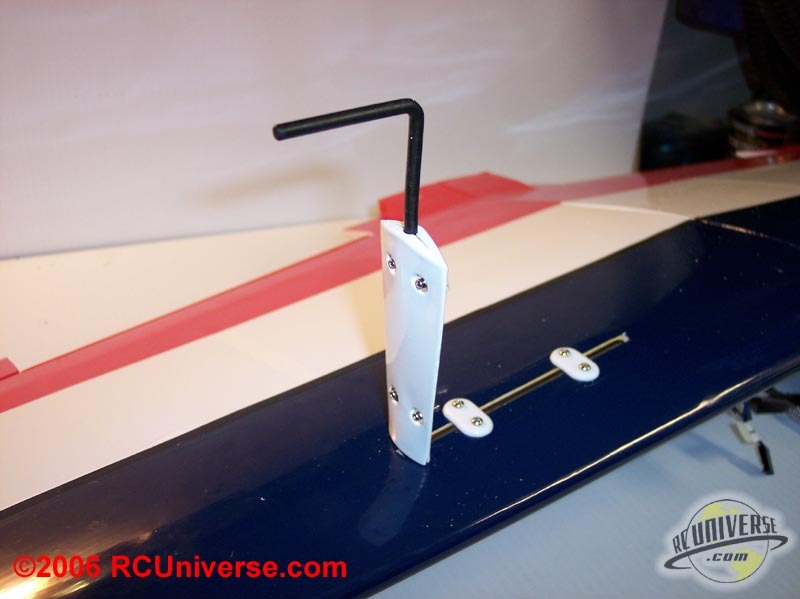 The rudder pushrod is a simple metal pushrod that runs through a pre-installed pushrod guide tube. 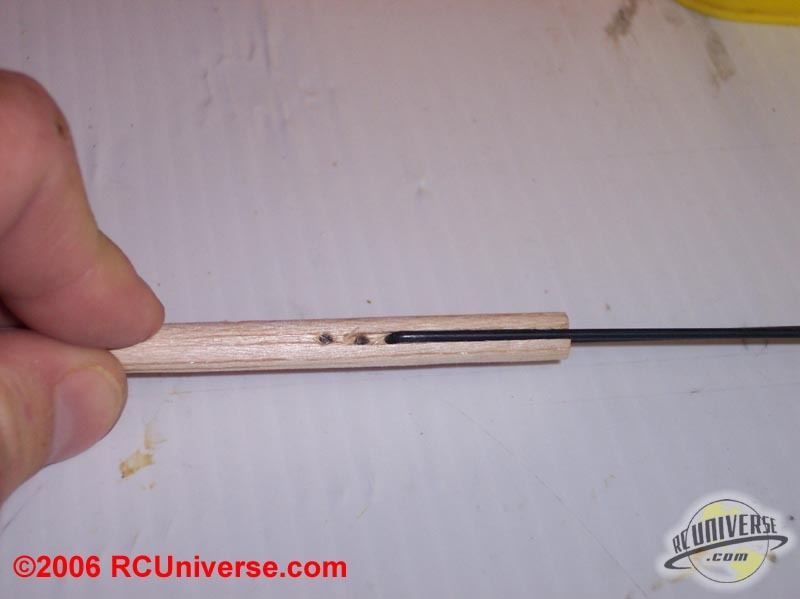 The elevator pushrod needs to be assembled from metal rods and a wooden dowel. 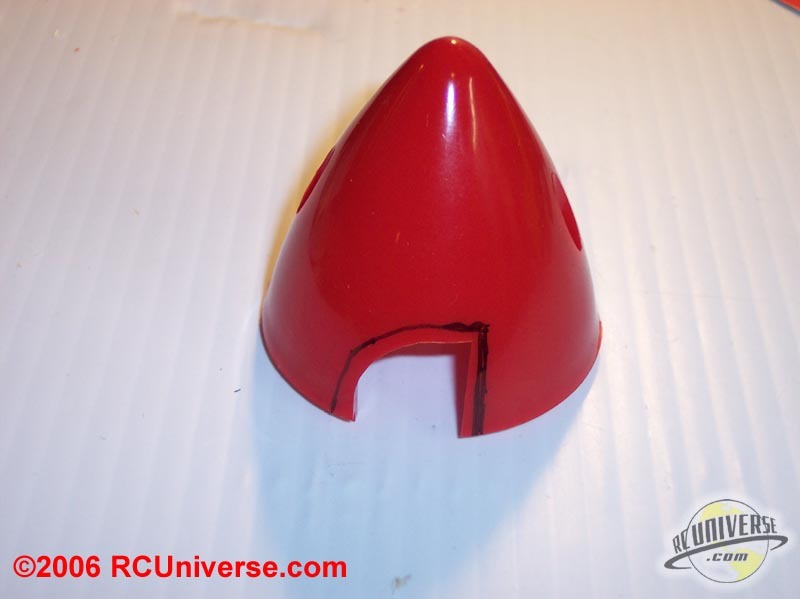 The rudder control horn is the same sturdy unit that was used on the ailerons, and is assembled in the same manner. The location for the mounting screws are pre-marked, so it’s an easy job of drilling, hardening the wood with CA, and installing the control horn. 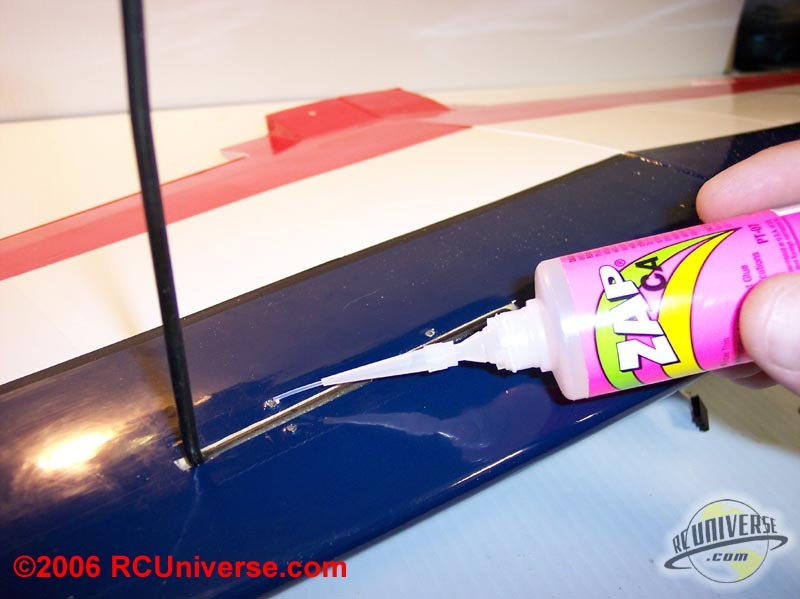 The guide tube for the rudder pushrod is pre-installed in the fuselage, so slide the pushrod into the tube. 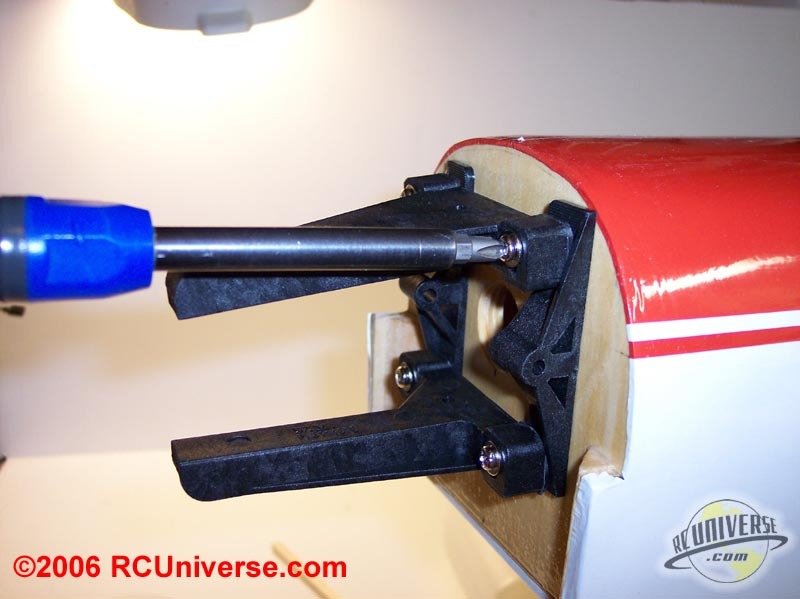 A silicon keeper and nylon clevis is installed at the rudder end of the pushrod. The instructions call for running the pushrod straight to the control horn, but I found that a small bend in the pushrod made for easier movement of the pushrod in the tube. 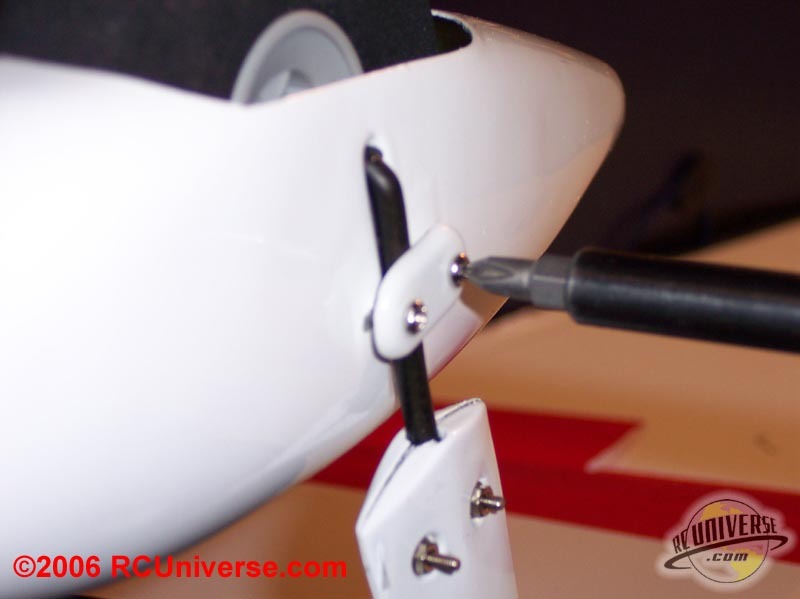 The rudder pushrod is connected to the servo control arm by using a L-bend and a nylon keeper to keep it in place. As I started to assemble the elevator pushrod I had some concerns about the method that was called for in the instructions. 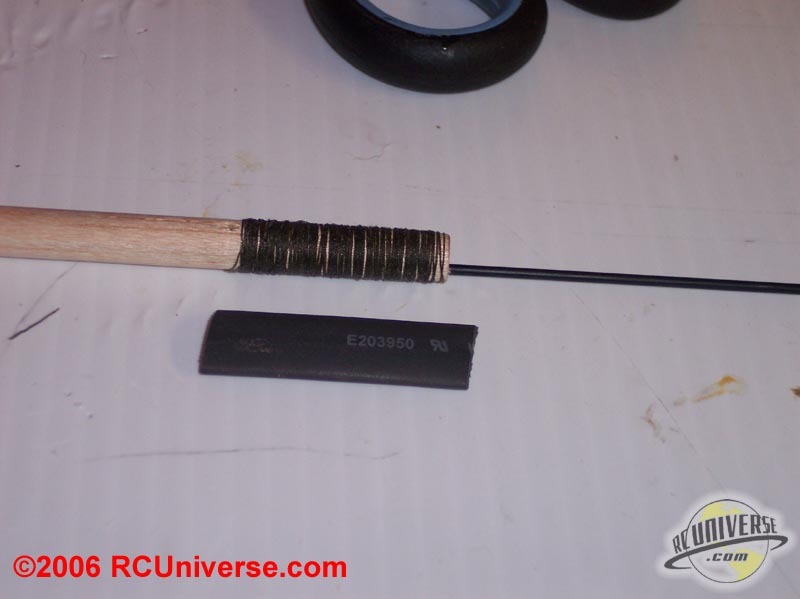 The instructions call for the pushrod to be assembled by using metal rods that connect to a wooden dowel rod shaft. This method for building a pushrod has been used for decades and is proven to be light and reliable. My concerns were with the method for securing the metal rods to the wooden dowel. 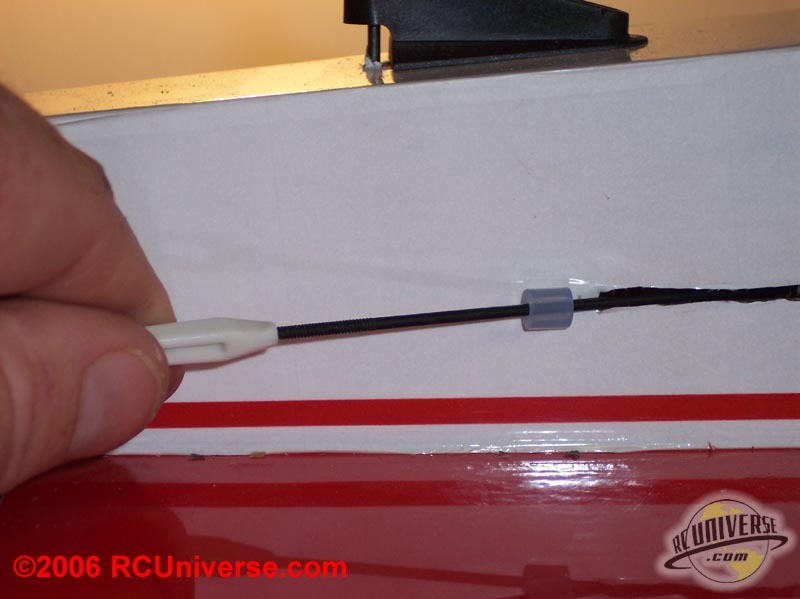 They called for sliding a piece of heat-shrink material over the area where the metal rods mount into the dowel rod. 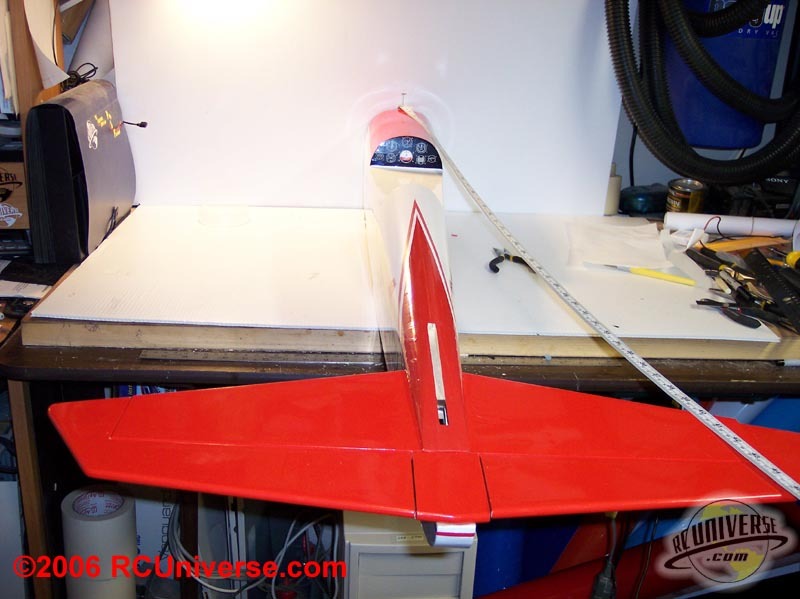 I have had other planes in the past with the same setup and have had problems with the heat-shrink material failing from stresses on it with continued movement of the pushrod. Since this was on the elevator of a very aerobatic plane I was worried that this would fail causing loss of the plane. So I decided to modify this part a bit. To increase the strength of the pushrod I used one of the older ways of building pushrods such as this. 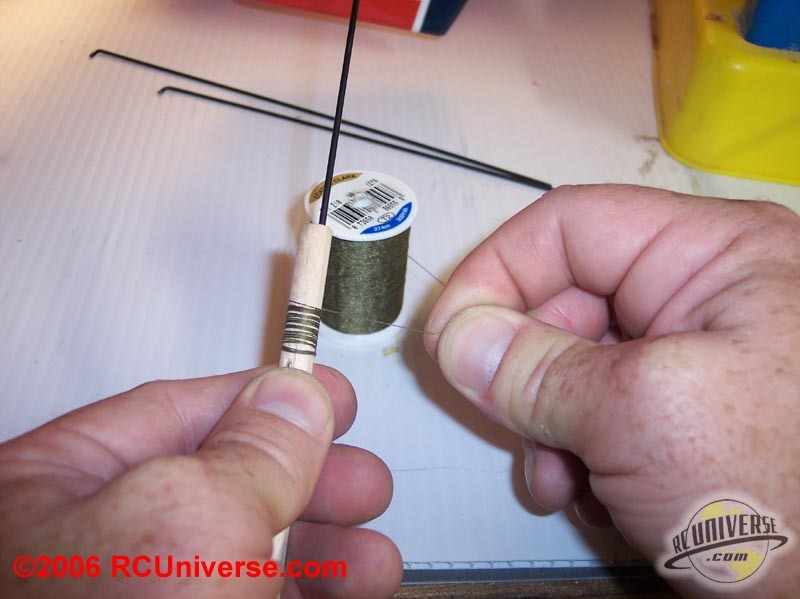 Place the metal rods in place in the wooden dowel rod, and with the rods in place wrap them tightly with ordinary cotton thread. Completely wrap the entire area of the metal rod. 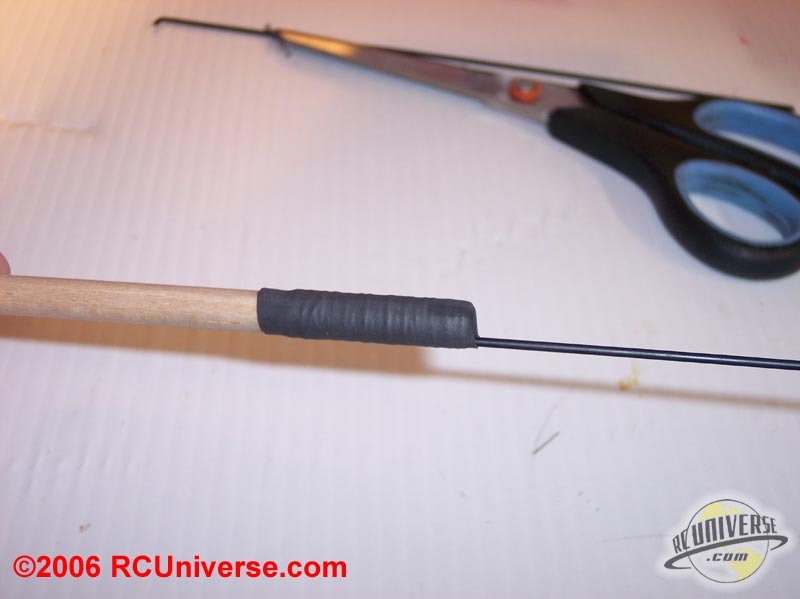 When you have it completely wrapped use thin CA to harden the thread and secure it to the dowel rod. 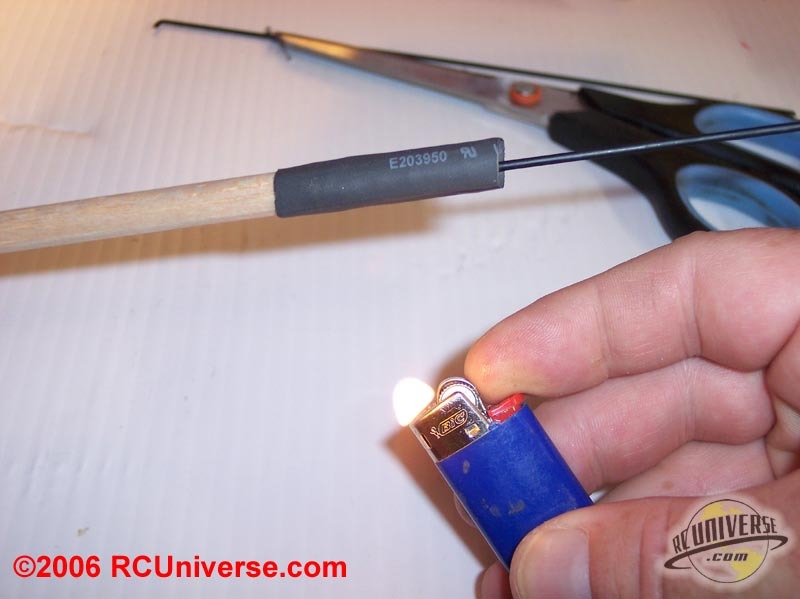 Now use the included heat-shrink material to cover the thread with. This gives one more layer to secure the assembly and prevent failure in flight. Slide the heat-shrink in place over the thread. 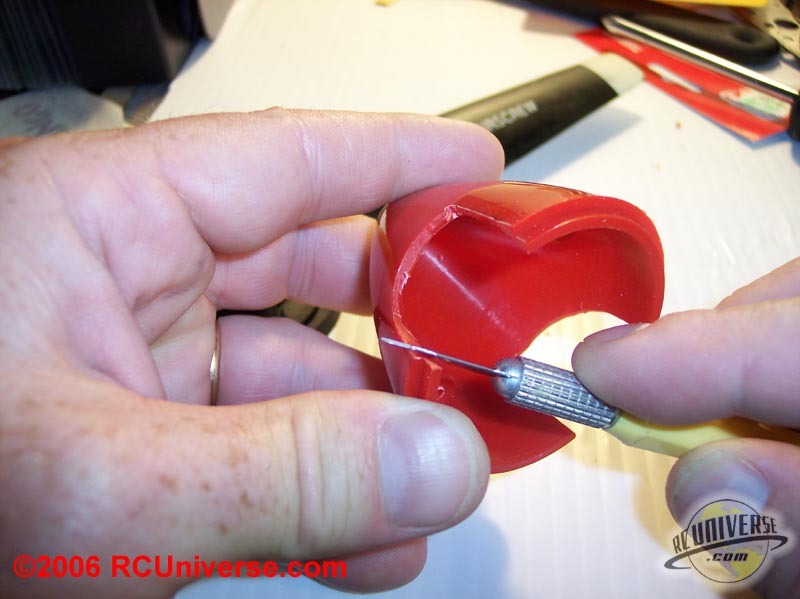 Use a lighter to heat the material to get it to shrink over the area. Once it’s in place you can be fairly sure that the pushrod will not fail in flight. 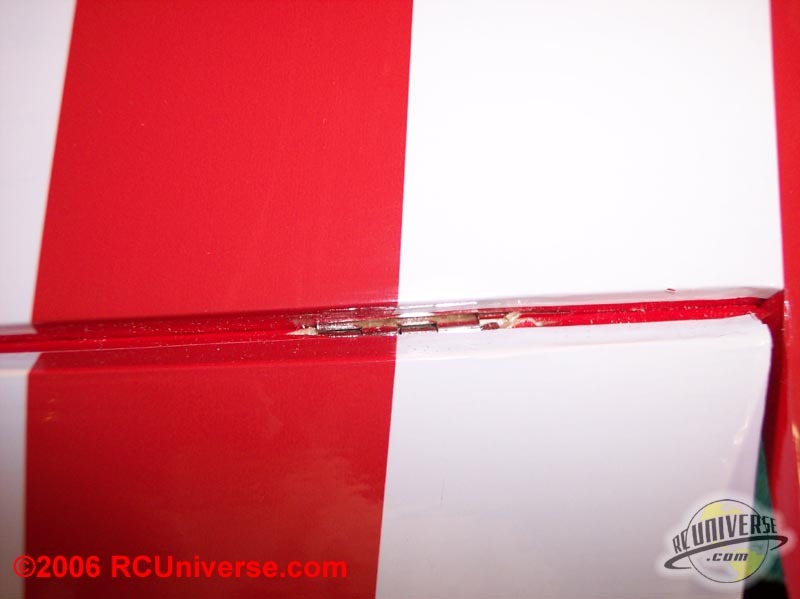 The elevator pushrods exit the fuselage on both sides of the fuselage. 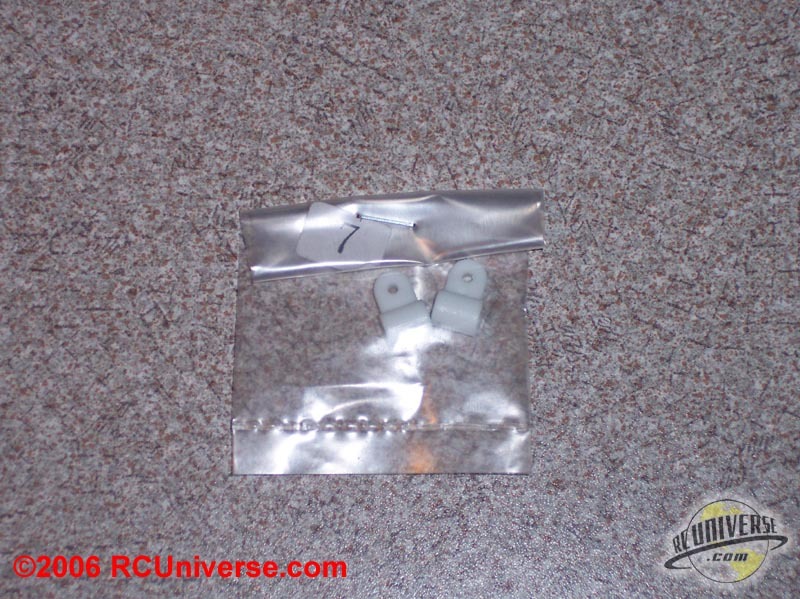 They run to the elevator control horns and use the same nylon clevis to attach to the elevators. 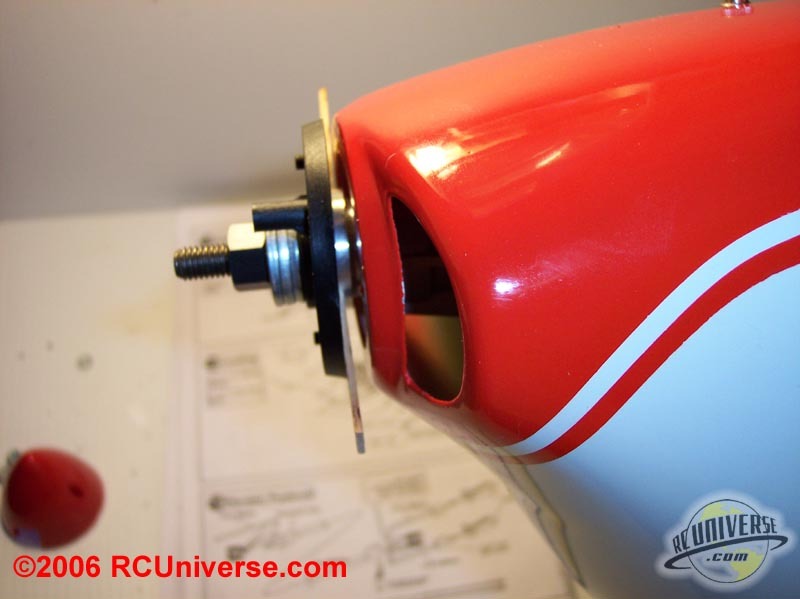 The pushrod is secured to the servo control arm by using a L-bend and a nylon keeper to hold it in place. 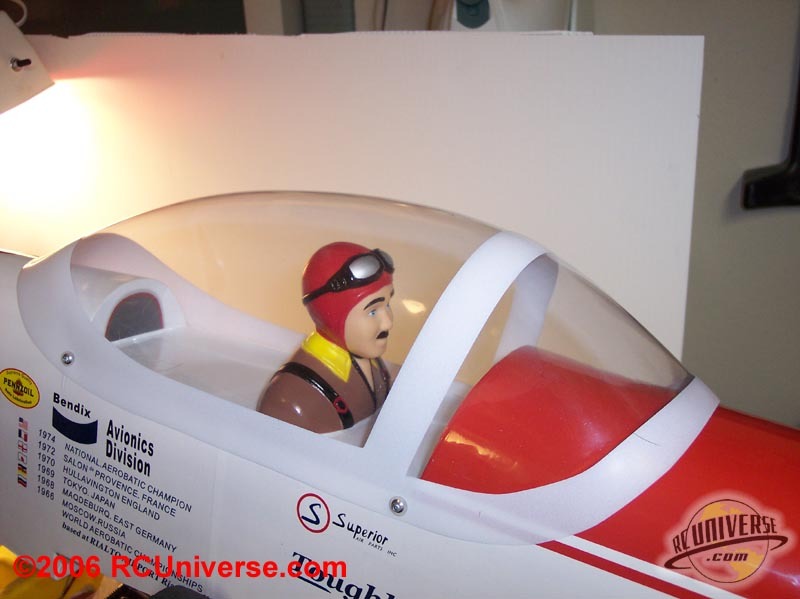 Included with the Super Chipmunk is a pilot figure, which is nice to see these days. 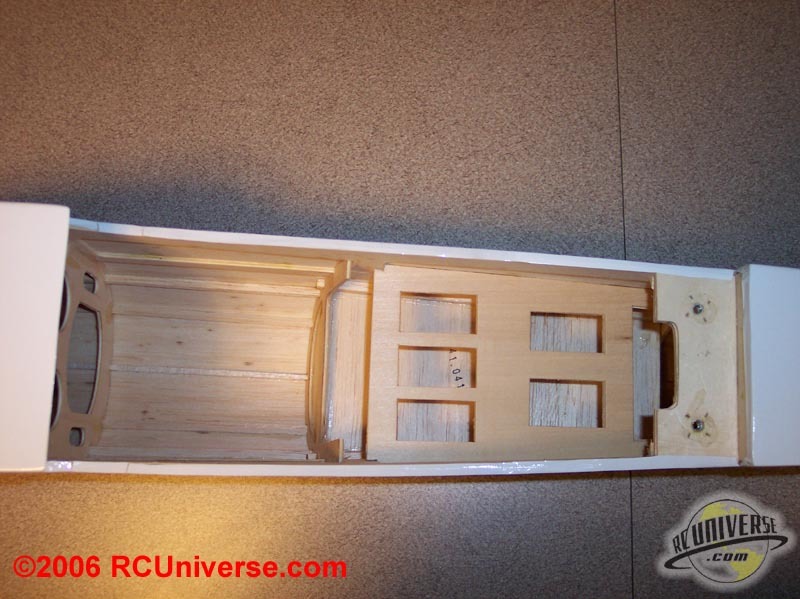 It makes for a nice complete plane without requiring the modeler to spend extra money for all the nice little details. 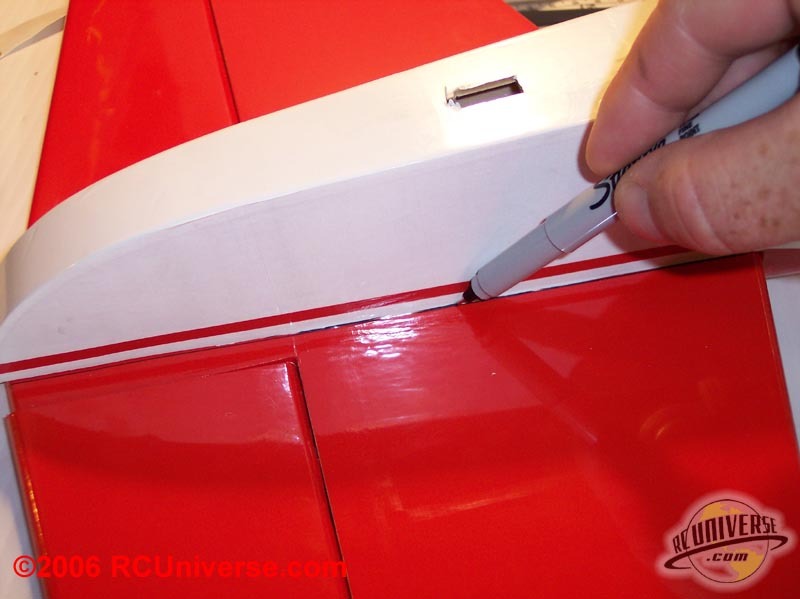 Included with the pilot figure is a double-sided adhesive pad. This provides a very secure method of attaching the pilot inside the cockpit. The canopy for the Super Chipmunk arrives with the mounting holes pre-drilled. This makes mounting it very simple. 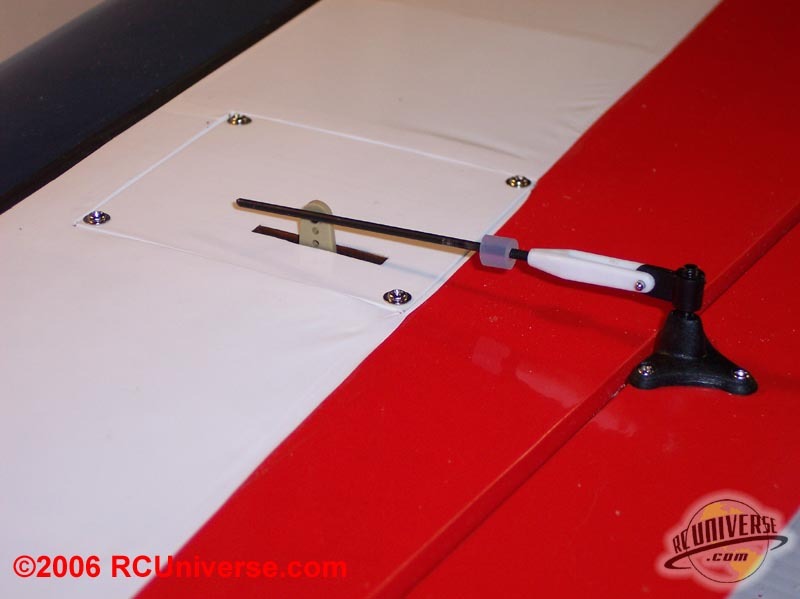 Place the canopy in the position you want to mount it in. Mark and drill 1/16? holes, use the provided screws to cut threads in the holes, harden the threads with thin CA, and mount the canopy when the CA has dried. 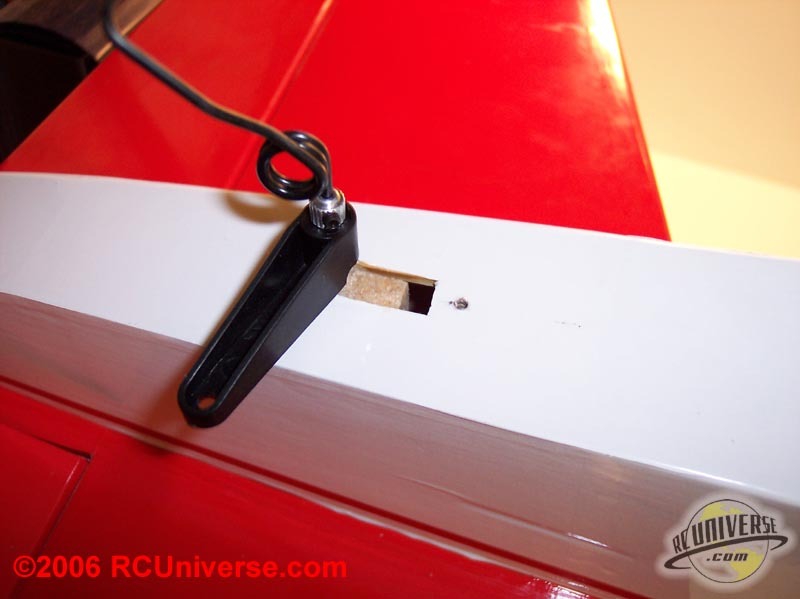 The 4 mounting screws securely hold the canopy in place while in flight. 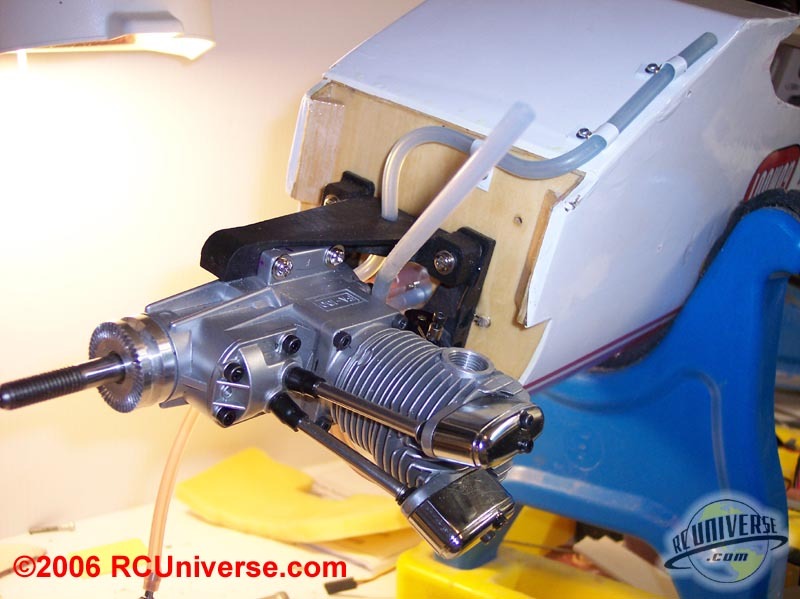 Up to this point you should already have all the servos mounted in place. So all that’s left of installing the radio is to mount the switch, install the battery pack, install the receiver, and route all the wiring. 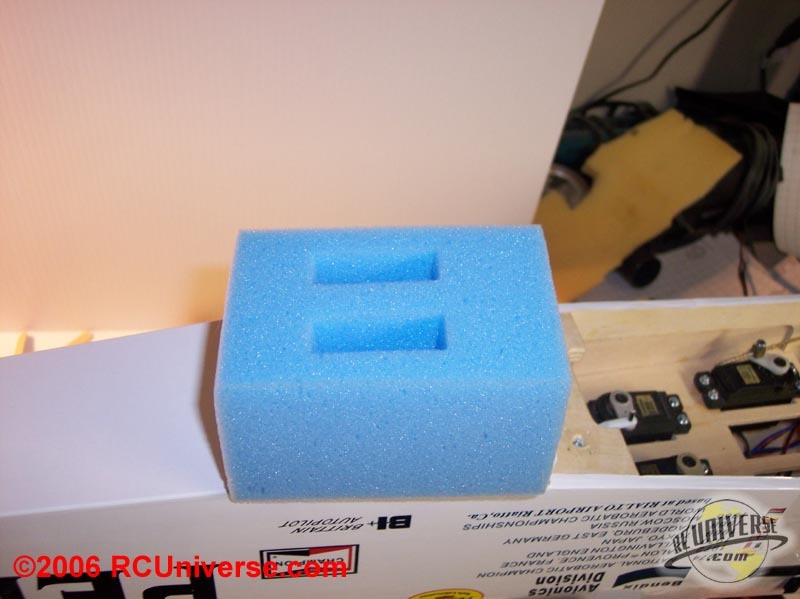 I was surprised to see a foam block included with the kit that is to be used for mounting the radio gear. 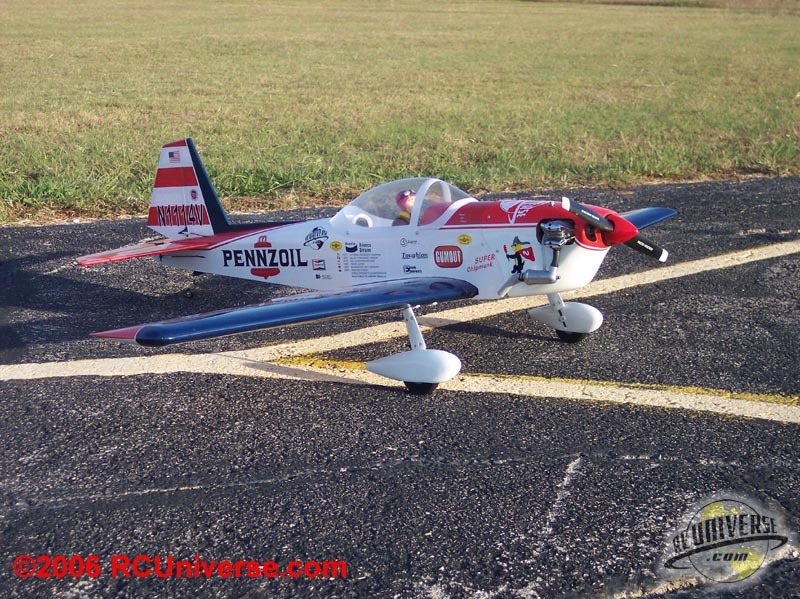 In 10 years of being in the hobby this is the first plane I have seen this in, and found it a very nice touch. 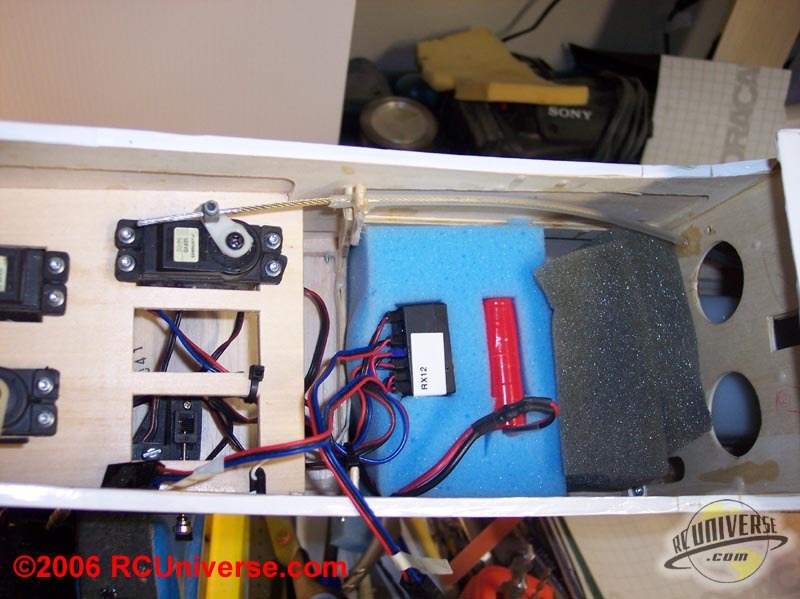 The block fits nicely in place between the servo tray and the fuel tank. There are cutouts in the foam for the receiver and battery to slide into. I did have to use a hobby knife to open up the slot for the battery as it would not fit in the pre-cut slot. With the battery and receiver in the foam it fits tightly into the fuselage, which has more than enough pressure to hold it in place. I used a Great Planes switch mount for the radio switch and recharge plug. 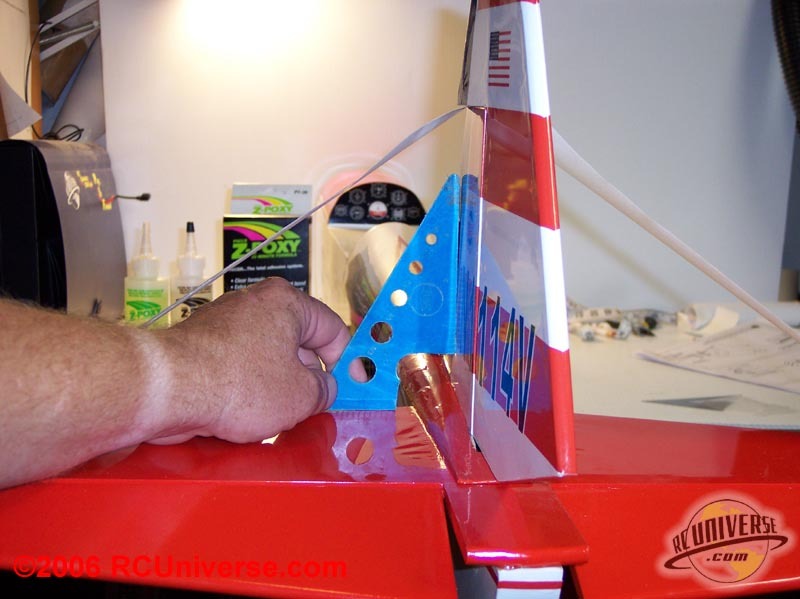 I placed it right above the servo tray as there was plenty of room, and this position did not interfere with the graphics printed on the outside of the fuselage. 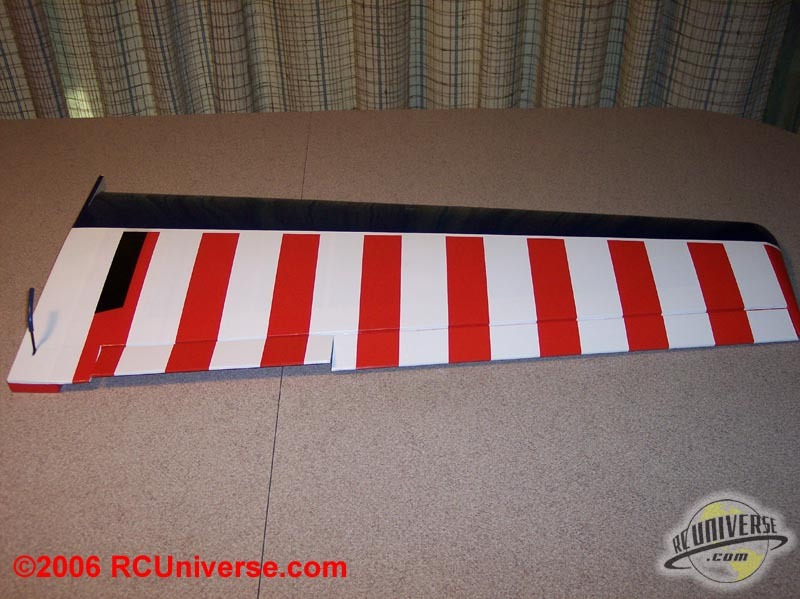 I routed the receiver antenna to the bottom of the fuselage and had it exit directly behind the wing. 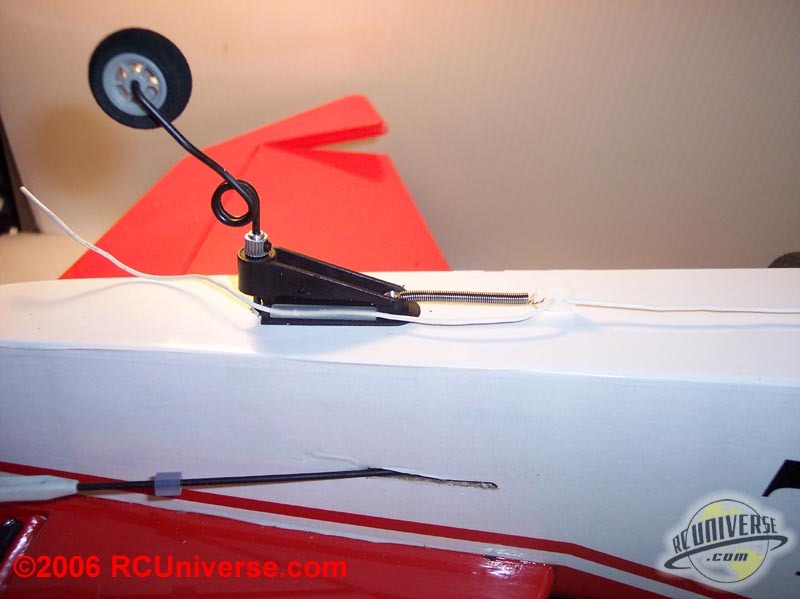 I ran the antenna down the underside of the fuselage and used a spring to attach it to the tailwheel assembly. I glued a small piece of tubing to the side of the tailwheel to help keep the antenna wire from getting damaged by the tailwheel while the plane is moving on the ground. When it came time to balance the Chipmunk I was pretty sure that it was going to come out nose heavy. This was because I had to move the engine forward in order to get it to fit properly. Putting the plane on the balancer showed that I was absolutely correct. It did come out nose heavy, although it wasn’t as bad as I thought it was going to be at first. I wanted the plane to come out balanced or just slightly nose heavy until I got a better feel for how the plane was going to handle. To get this balance required adding 1 oz. of lead to the tail of the plane. The final balance for the plane was just slightly nose heavy. 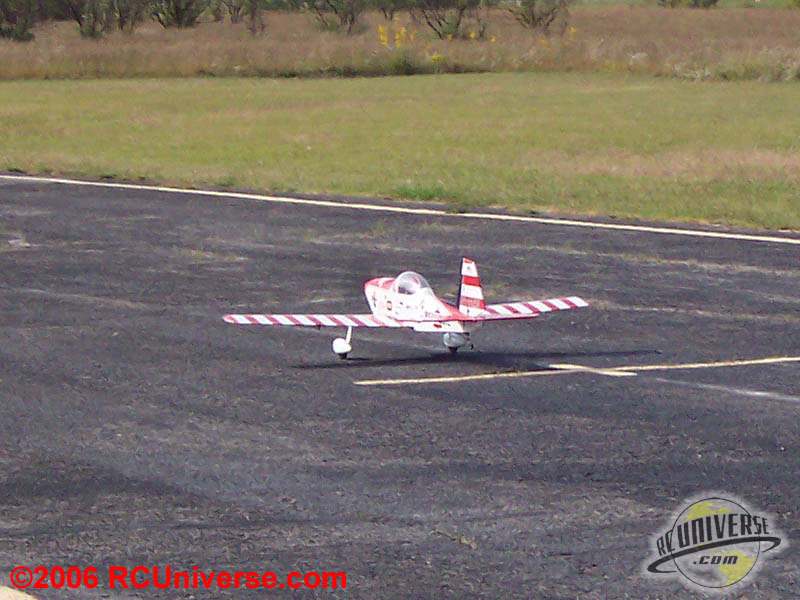 The weather for the maiden flight of the Chipmunk was just about perfect: temperature was in the upper 70’s, a slight wind right down the runway, and just a little bit of high thin clouds. After doing the standard pre-flight checks it was time to fire up the engine and get this bird in the air. 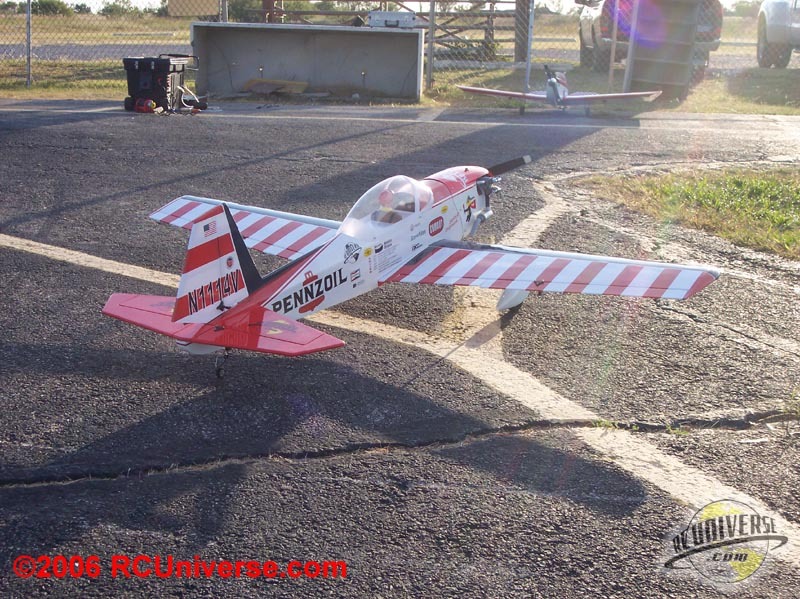 Because the Saito has been used on other airplanes I didn’t have any worries about it for the maiden flight. In fact she fired up on the first flip and she was ready to go. While taxing out I discovered that I just couldn’t slow down the engine idle enough to keep the plane from rolling (Note: I later corrected this by placing a piece of silicon fuel tubing between the wheels and the wheel collars on each axle. This created enough friction to keep the plane from rolling at idle). Turning the plane into the wind I gave the control surfaces one last check and pushed the throttle forward. The tail on the Chipmunk lifted off the ground quickly and the plane was ready to rotate at half throttle. I turned the plane into pattern and set about 2/3 throttle to trim the plane. 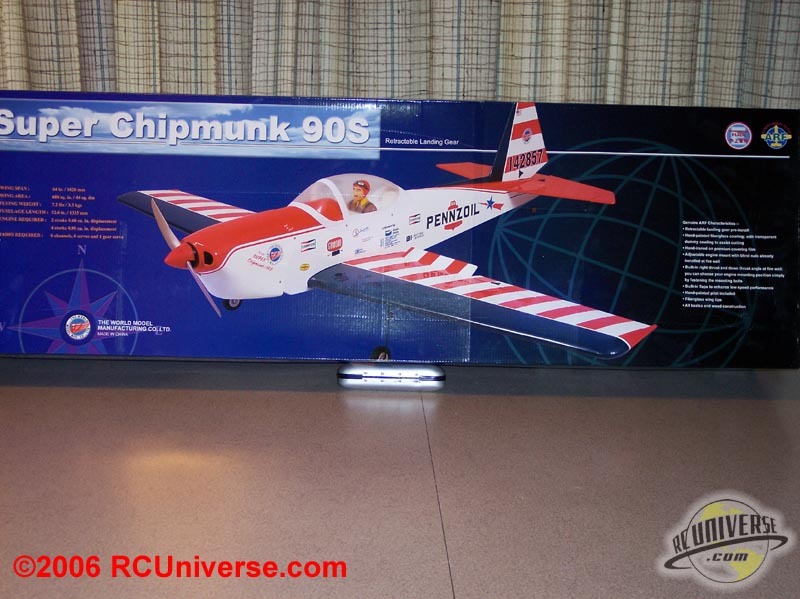 The Chipmunk required only one click of down elevator and one click of left aileron before she was flying hands free. WOW, what a beautiful sight she was in the air. I flew two slow lazy laps around the field just admiring the looks of this bird before I started to see what she could do. 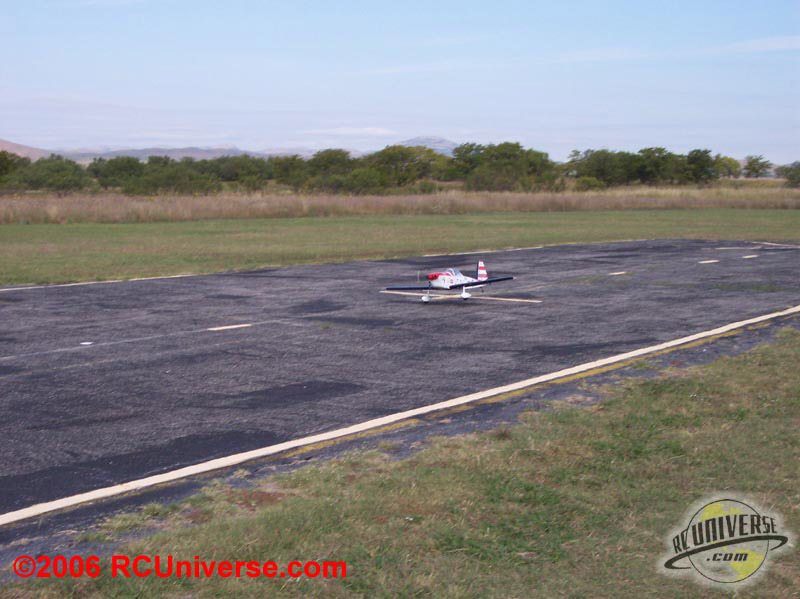 In ten years of flying I’ve never had a maiden flight that wasn’t a nervous ordeal. That is until now. Once the Chipmunk was in the air and was trimmed out I noticed that I felt very comfortable flying her. I was enjoying flying this plane more than most planes that I’ve flown lately. First things first: I took her up to a few mistakes high to see how the stall characteristics were. Cutting the throttle back the plane slowed down and stalled straight away with no surprises at all. With the nose pointed down I put her into a very nice spin, which she recovered from by bringing the sticks to neutral and applying power. Next up came the basic maneuvers of the loop and the roll. The plane tracks straight through a loop, and only took minimal elevator input to produce a very nice large round loop. 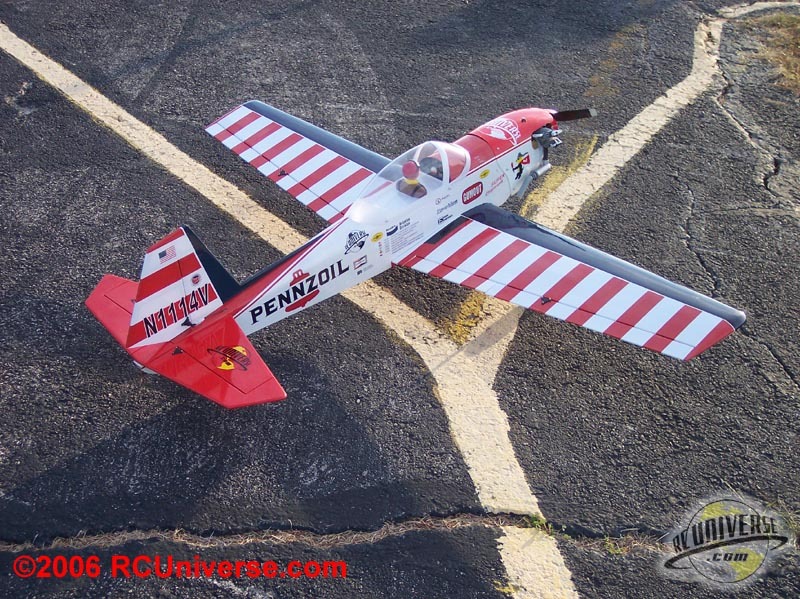 Crossing the field the Chipmunk produced a very axial roll that required almost no elevator to keep the roll level. Right about now I think I must have had a huge smile on my face, because I really was enjoying putting this plane through its paces!! With the basics down I decided it was time to see how this plane would land. Since the Super Chipmunk is equipped with full flaps I did a couple of slow speed passes over the field first to see how the plane reacted to deploying the flaps. 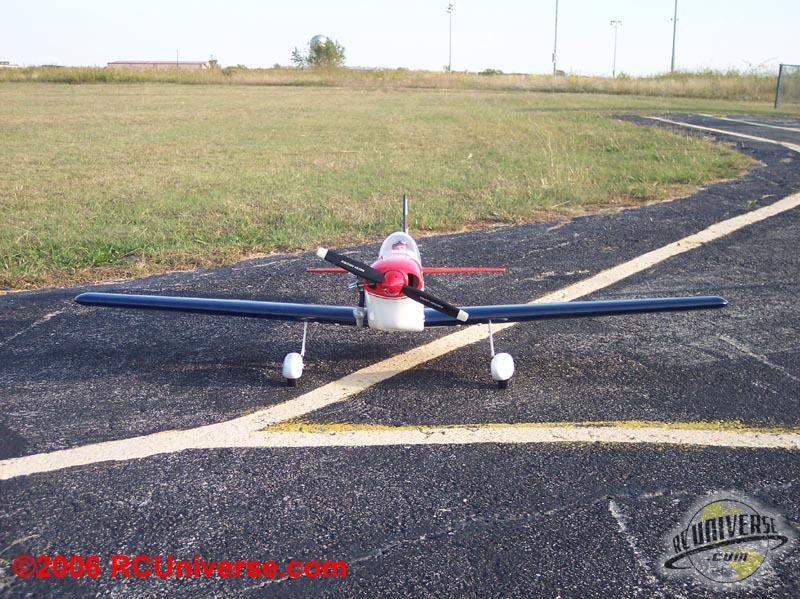 With the throttle to just a couple of clicks above idle I dropped the flaps to about 20% and was rewarded with the plane flying straight and level down the length of our field at a speed that was probably about the same speed as I can walk. Wow!! It was really a site to see. Putting the flaps back up I circled the field and lined up for a normal landing. With the throttle at idle the Chipmunk slows down for a very tame landing. There were no surprises at all in bringing her in. She settled down for a smooth touchdown on the runway. After refueling it was time to go back up and turn it loose to see what the plane was capable of. First off was Knife Edge flight. 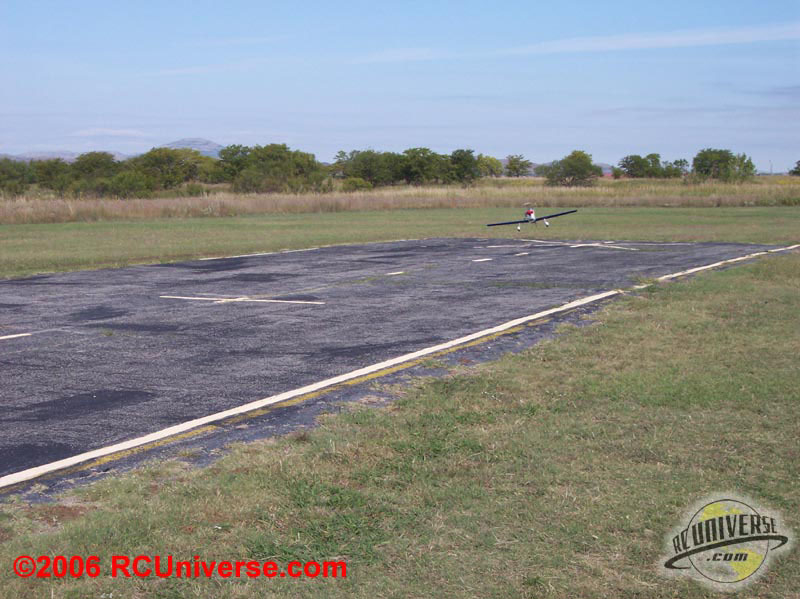 The Chipmunk pulled into a Knife Edge that was easy to hold level for the entire length of our flying field using only about 1/3 rudder. 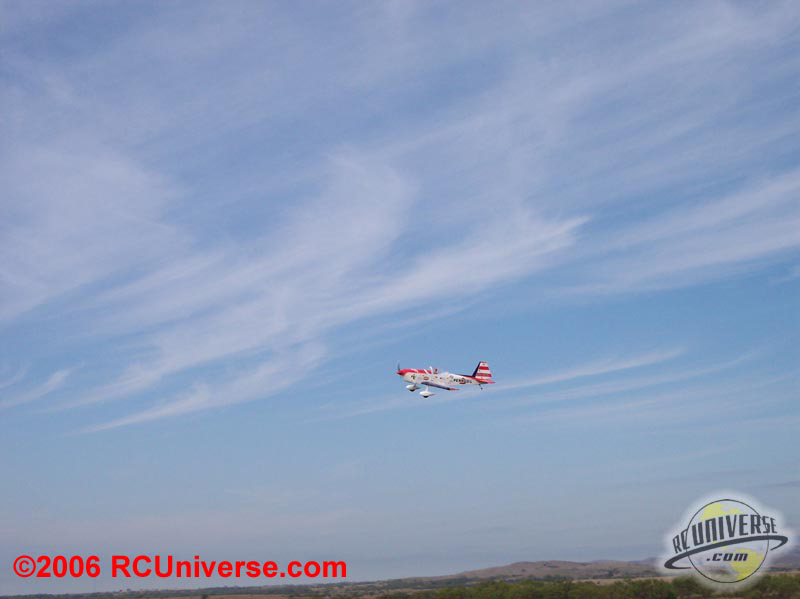 Inverted flight was easy to maintain with just a little bit of down elevator to hold level flight. Pulling vertical I found that the plane has more than enough rudder authority to perform a very nice Stall Turn. Time was running out on the day so I had to cut the flying short. But one thing is for sure; I was having a blast flying this plane that day and wished the day could have been longer. One thing that I knew for sure, this plane had found a new home in my hanger. I plan on keeping her and think that I’m going to enjoy every time I get to fly it. World Models really has a hit with the Super Chipmunk RF. 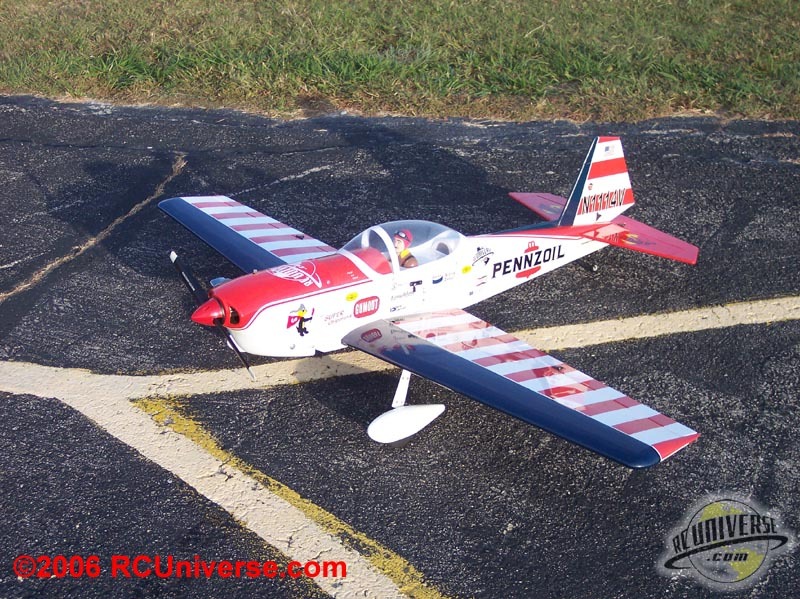 World Models has always had a reputation of producing quality ARF aircraft, and they definitely continue that tradition with the Super Chipmunk RF. The plane is an outstanding flying plane that lives up to the performance reputation that its full scale counterpart is famous for. 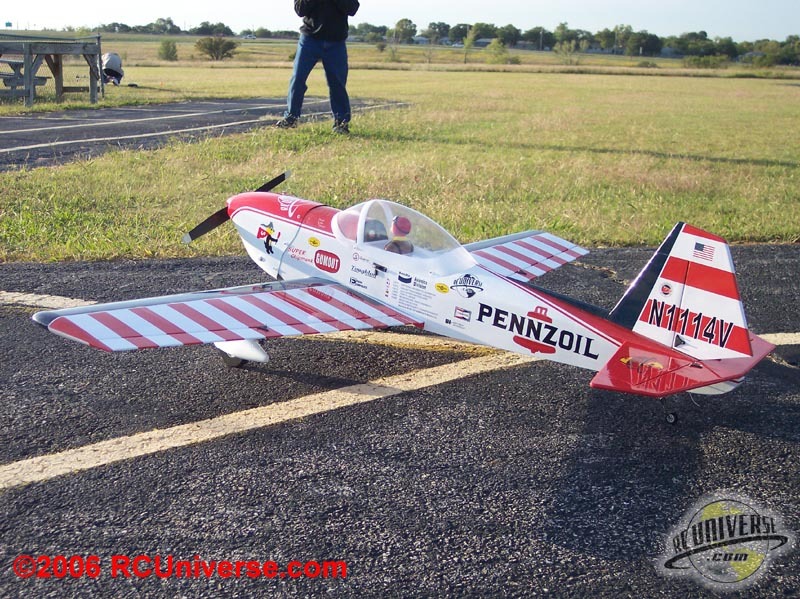 The plane is accurate in it’s covering scheme as well as in performance. If you’ve ever taken a second glance at a picture of a Super Chipmunk then this plane is definitely for you. The Super Chipmunk is capable of performing most advanced aerobatics with ease.Yet the plane will slow down and fly tame enough for new pilots to feel comfortable flying. In the Super Chipmunk advanced pilots will find a plane that responds crisply to all of the inputs and rewards them with aerobatic maneuvers that look outstanding. 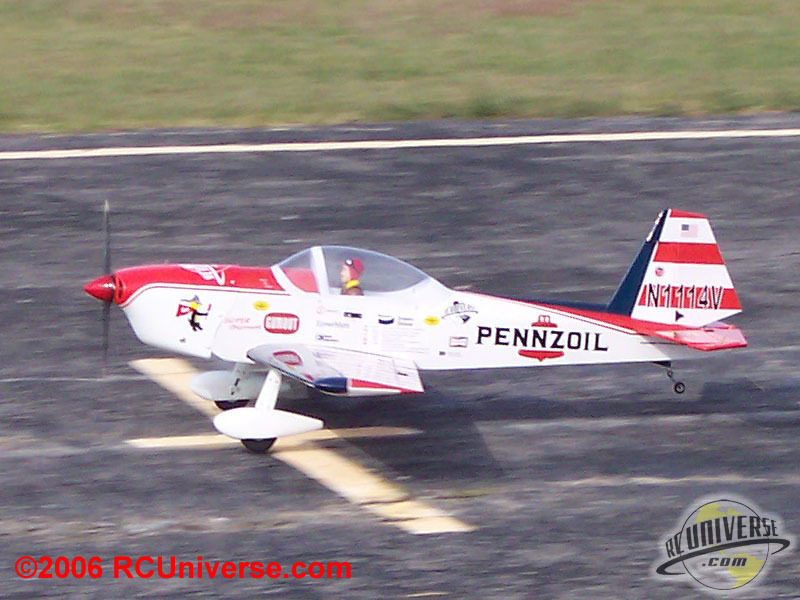 Newer pilots will find a plane that will allow them to learn aerobatic flight without “biting? them in the process. This plane has a little something for everybody. 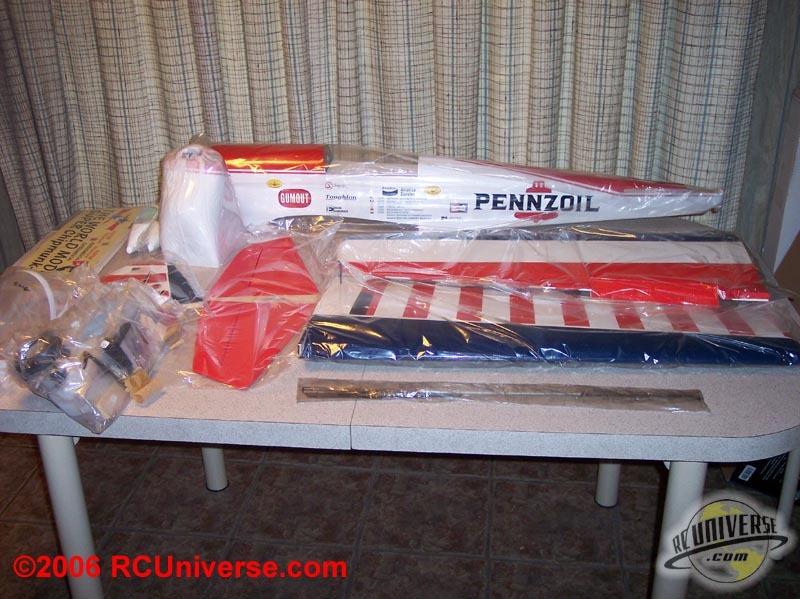 World Models has done an outstanding job in putting together an ARF package that is well worth the money. 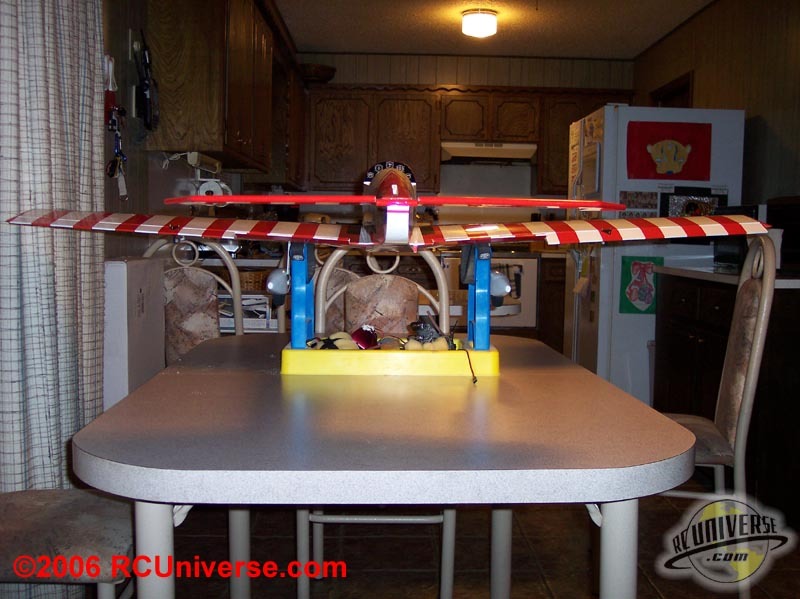 Most modelers should be able to assemble this plane in about a week’s worth of evenings with standard tools. 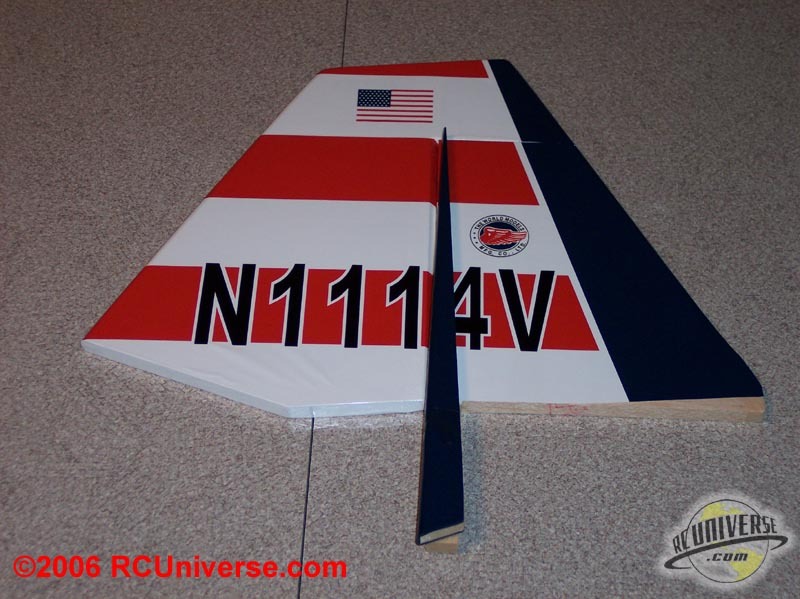 The included hardware package is very complete and the quality is definitely up to the task for this plane. World Models definitely has a hit with the Super Chipmunk RF. This plane should be a welcome addition to anybody’s hanger. Well done World Models.